Fresh from Barcelona, we took a plane ride to Croatia!.. 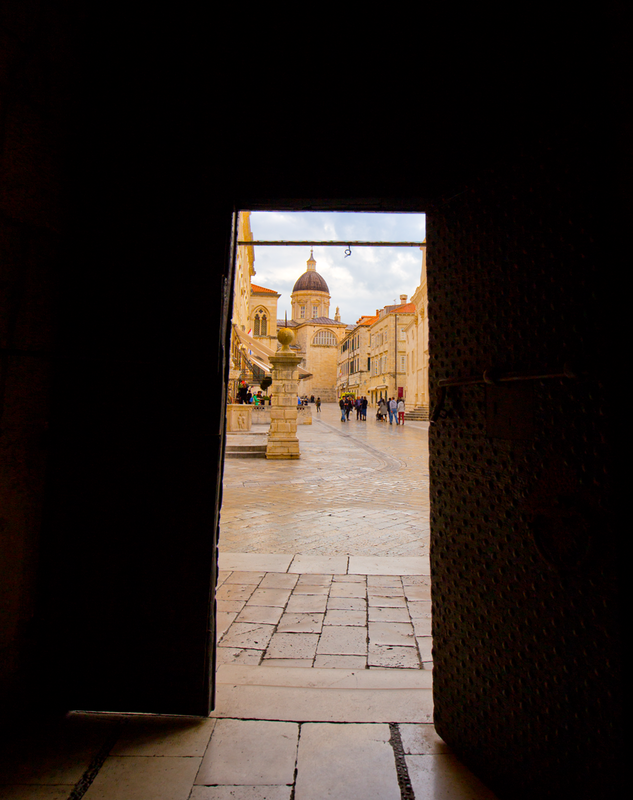 A large chunk of our recent European vacation was devoted to the magical, mystical city of Dubrovnik, Croatia. 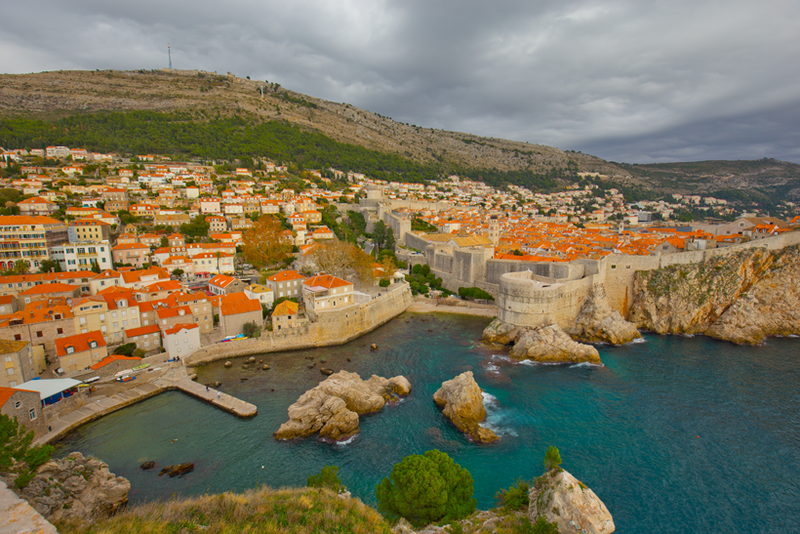 Though it has always been a popular travel destination, in recent years, Dubrovnik has become even more popular due to the fact that it is a major filming location for HBO's Game of Thrones. 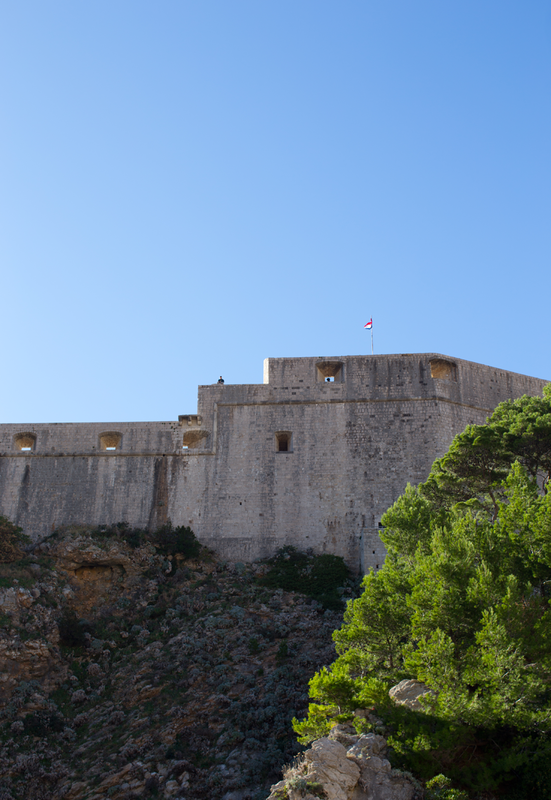 Dubrovnik is basically King's Landing + The Red Keep..
A bit About Dubrovnik. 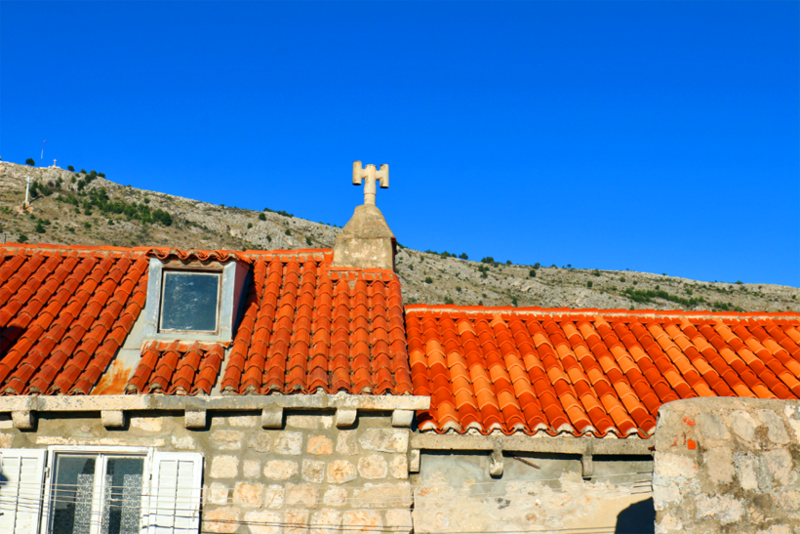 Dubrovnik is also popular due to its placement on the UNESCO World Heritage Site List. 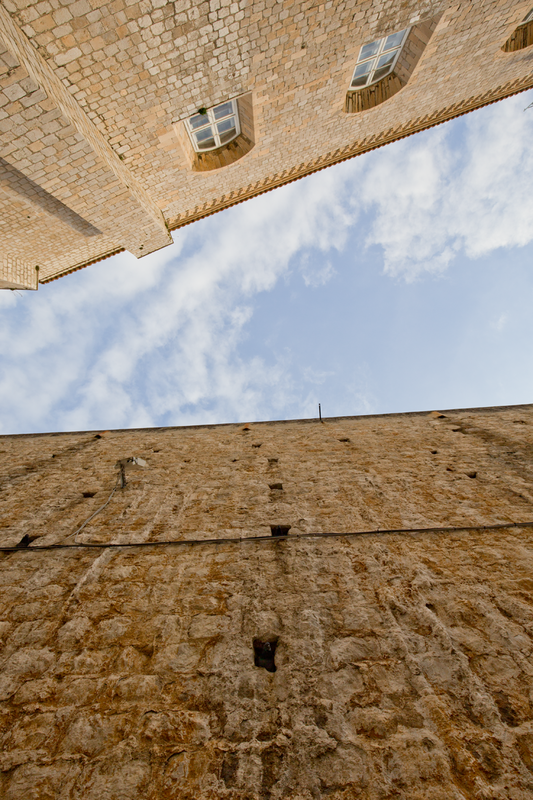 Dubrovnik's walled "Old Town" has long been heralded as one of the most well preserved medieval cities. 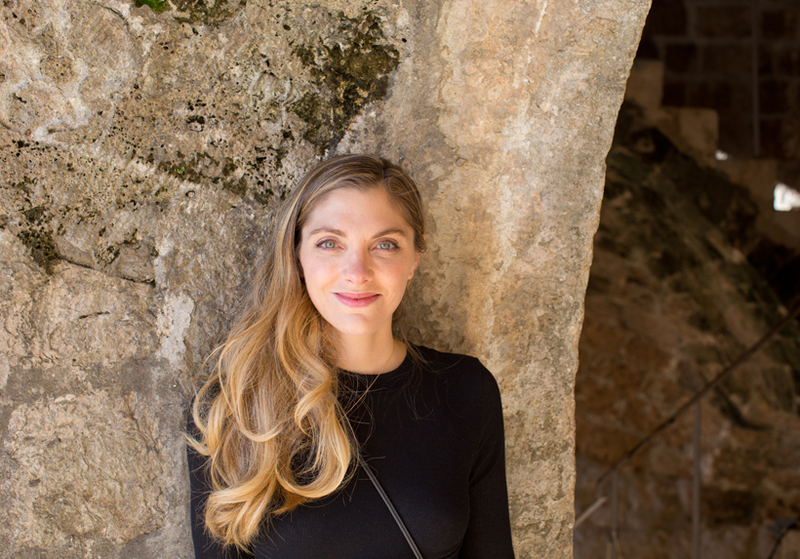 I love this description from a travel site: "Jutting out into the Adriatic Sea with a backdrop of rugged limestone mountains, Dubrovnik Old Town is known as one of the world's finest and most perfectly preserved medieval cities in the world." GOT fandom has brought tourist numbers to al all-time high. 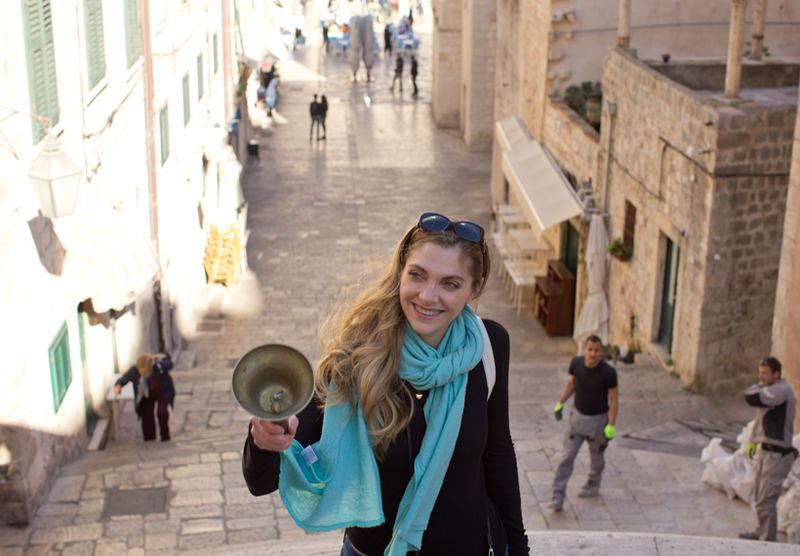 The Telegraph wrote, "Crowds and Cruise Ships Have Ruined Dubrovnik." And if you google videos for "Dubrovnik Crowds" you will find videos like this that show the city streets and the famous walls of the city simply packed with tourists. So... my husband and I knew we wanted to visit Dubrovnik, but we also knew we wanted to visit it during the off-season. And I am so happy we did. 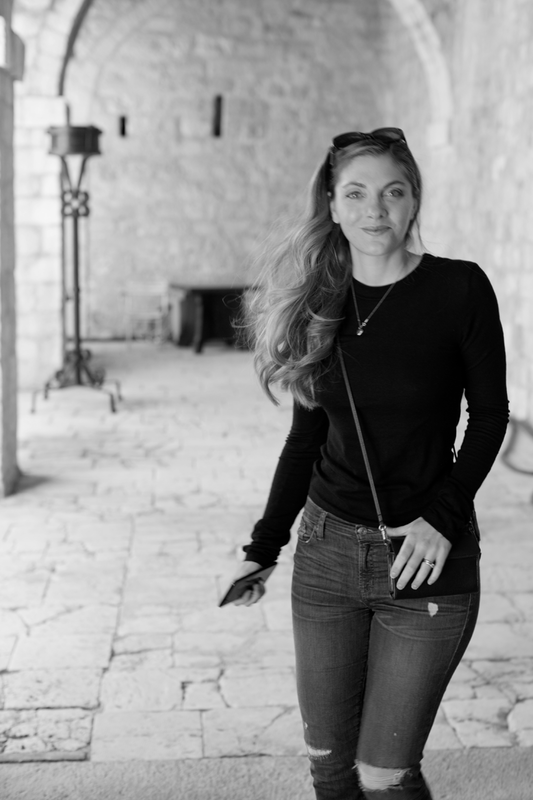 I absolutely loved our time there and have loads of travel tid-bits and photos to share with you guys today..
Before I dive into my "beautiful vacation photos and stories" I want to say, on a personal note that these photos and this trip really meant a lot to me. 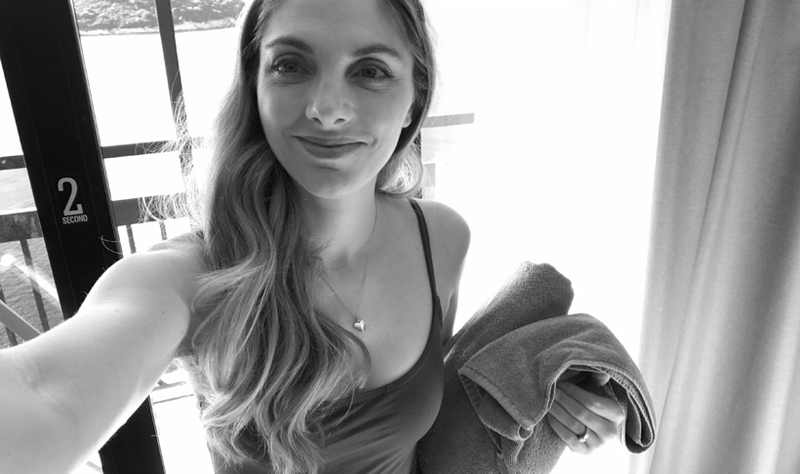 The past two years have been a bit challenging in multiple ways, a few more bumps in the road than usual, and to have moments where everything just feels HAPPY and OK, safe and beautiful - well that is a huge gift. So as you scroll through pretty pictures, I just want you to know that each moment carries some serious healing + love + joy for me and was experienced with so much gratitude in my heart. Maybe that sounds terribly cheesy, but it's true! Life isn't perfect, and vacation comes and goes, but those moments where you can feel whole and happy and inspired never leave you. 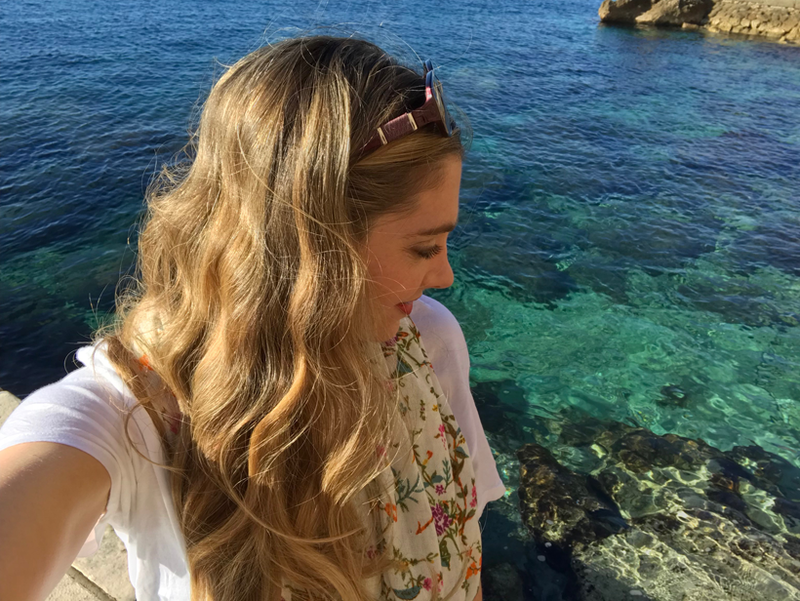 Oh, and if you want the video version first, here it is: Dubrovnik Travel Diary.. When is "off-season?" I asked a few people and the consensus seemed to be: late October to early March. We visited in late November. Before I get to the good stuff, there are a few downsides to visiting Dubrovnik during the off-season. 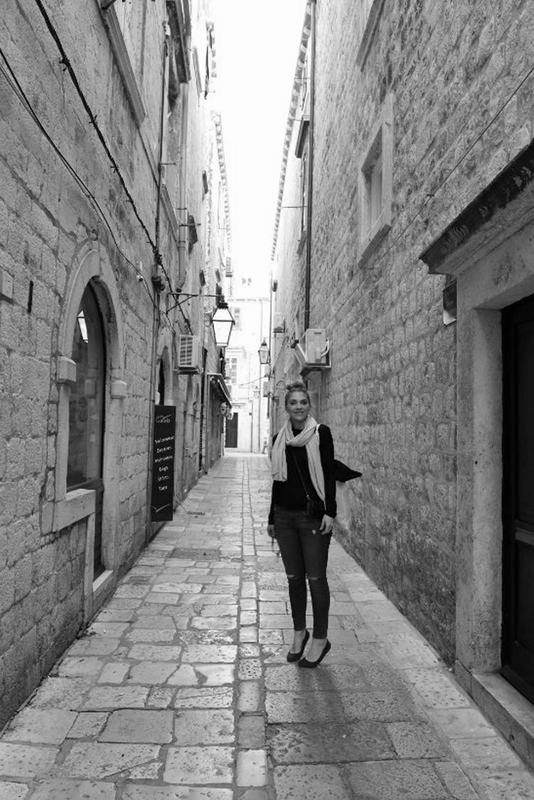 The downsides to Dubrovnik during the off-season of fall + winter..
1. Rain. Dubrovnik is known for its rainy season. One of our tour guides said that when it rains it can POUR and rain for sometimes twenty days straight. 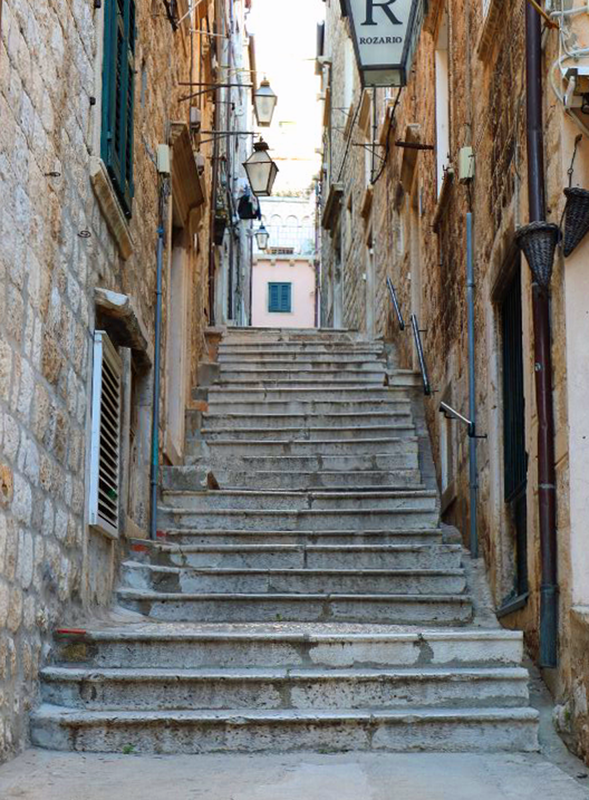 The towering steps and slick limestone cobblestone streets of Dubrovnik become slippery and quite dangerous making it hard for tourists to enjoy their time. A little rainfall would be fine, and possible even lovely for setting a cozy mood, but pouring rain or rain for days could possible ruin your trip. We were EXTREMELY lucky with weather. The temps bounced around from the 50's upwards of 69 degrees! Loads of sunshine with a few clouds. Nights got cold, but I was still fine wearing just a light coat and scarf. 2. Travel. Getting to and from Dubrovnik is more challenging during the off-season. 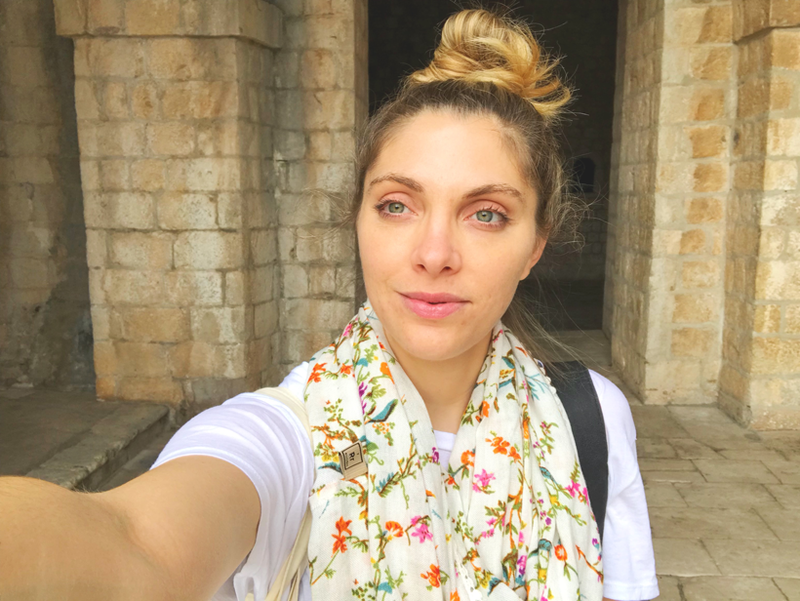 We spent weeks and weeks debating our travel itinerary and even almost took Dubrovnik off our travel plans because flights just were not working out. 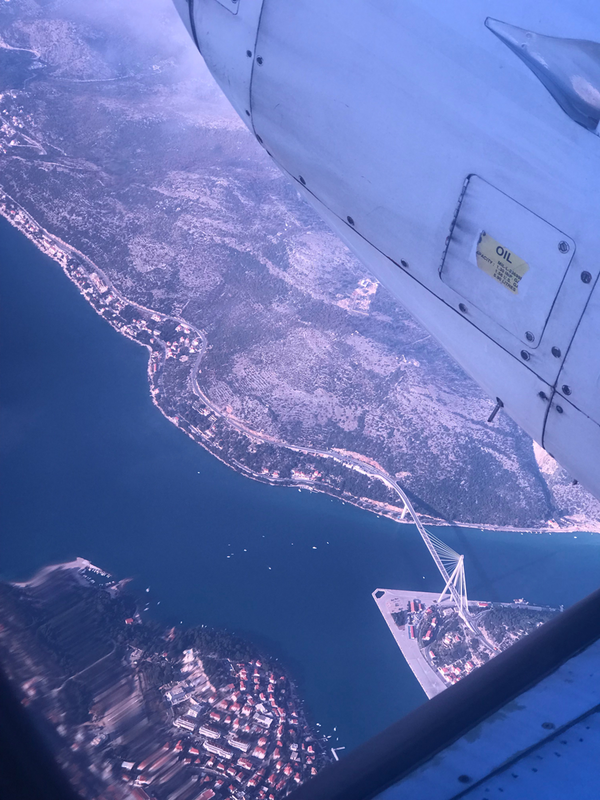 Luckily, Dubrovnik has its own airport, about 30 minutes from Old Town, but the flights are much less frequent in fall and winter and the option of ferrying over from Bari, Italy is completely out. We flew to Barcelona first, then to Dubrovnik, then flew "home" on a flight taking us to Split, Croatia, then Rome - where we stayed over two nights - then home to Los Angeles from Rome. That home flight path was a lot of airplanes (tiny ones too!!) but in the end it was very worth it. 3. Activity Limits. Unfortunately, in the off-season activities are limited. The boats going to nearby islands like Lokrum are basically shut down. And activities like kayaking and beach bathing are mostly out. Also, if your hotel has a cool pool or diving spot on the ocean, you really cannot access that in the cold seasons. Our hotel usually has lounge chairs on the lower level, on the water, but it was vacant this time of year. Missed that activity, but I personally did not miss the crowds! 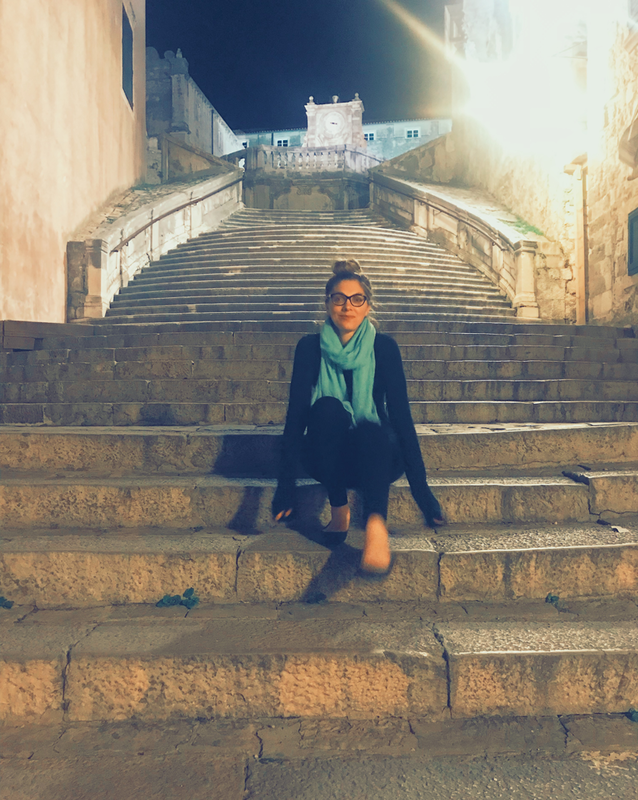 This worried us a bit because we thought we might get bored, but if you love the atmosphere of Dubrovnik as much as we did, trust me, you will never feel bored. Simply wandering the streets is enjoyable! 4. Dining Limits. Many of the restaurants shut down during the off-season and stores can even close up shop without much notice or limit hours. This makes it more challenging to eat, but still totally doable. Many times you are the ONLY person dining at a restaurant, which actually has its benefits! So yes, there are a few pitfalls to off-season travel, but for my husband and I, the charm of the city in the off-season completely made up for all the little struggles. The late-afternoon sun the day we arrived. 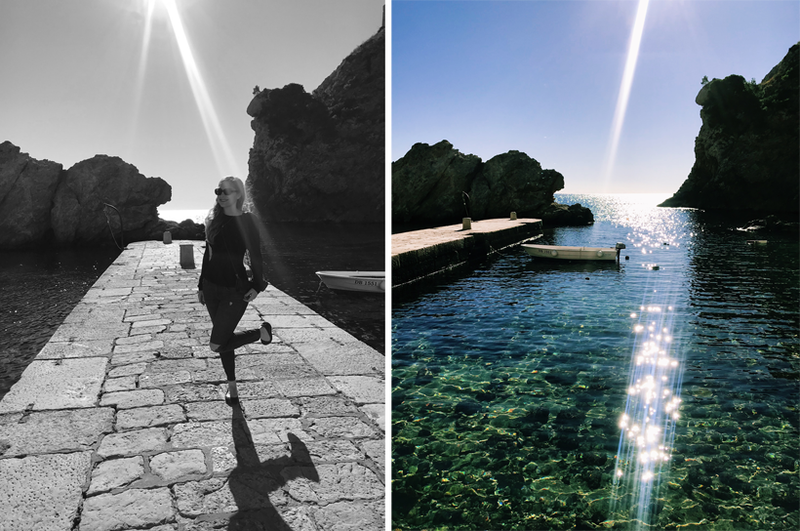 Definition of g l o w and a perfect introduction + welcome to Dubrovnik! 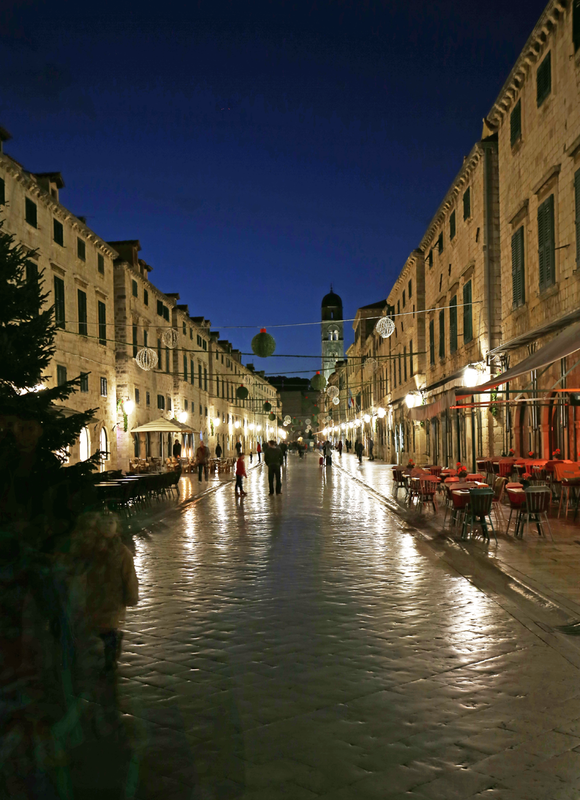 This is really the number one reason I can give for visiting Dubrovnik during a time of year when there are very few tourists and you truly feel, at times, that you have Old Town all to yourself. Which feels magical. I noticed that magic the first night we arrived, when we first walked down to Old Town, walked towards the Pile Gate, heard the gentle sound of the stone beneath our shoes, saw the twinkly city walls lit up, felt the majesty of it all -- and were immediately transported to another time and place. I whispered to my iPhone as I filmed on my Instagram stories.. "Omg guys, we are in King's Landing!.." But really, if there had been hoards of tourists all doing the same thing, the magic would be less glorious. Those odd magical moments are what I seek out for travel. I want to be taken away, to another place. I want to be given space from my everyday life. I want new surroundings, a new mood, a different feeling. 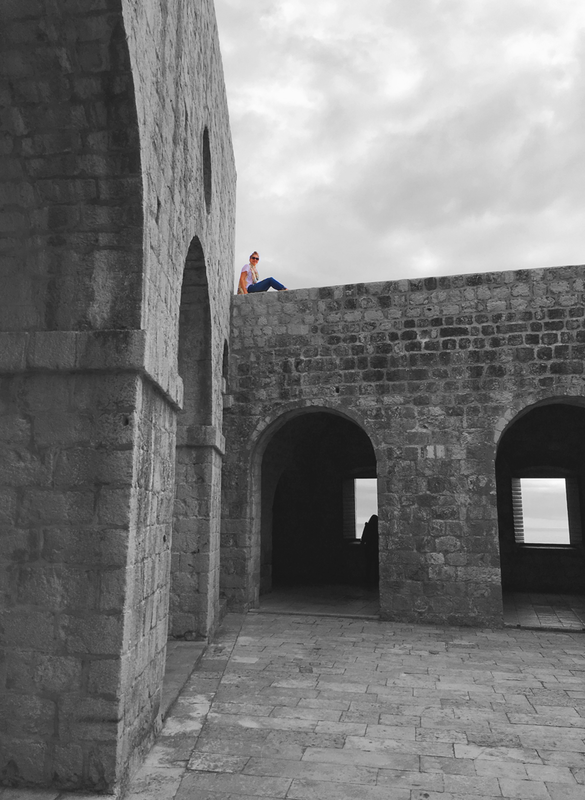 Dubrovnik is one of the most transporting and magical destinations I have ever been to. Those shiny streets, prancing kitty cats, twinkling lanterns and lights, echoing of boots down narrow side allies, laughing kids playing with a soccer ball in the main square of the old city - chasing their friends almost unaware of the awe-struck tourists around them, soft-lit restaurants ready for guests, and those endlessly tall walls, towering above you like ancient redwood trees or rocky mountains, radiating a sort of warmth and history in each gritty stone stacked into place. I obviously don't know how 'magical' Dubrovnik feels during the on-season. But for me, feeling the streets in a naked way, their vacancy feeling special, and experiencing the Old Town in its most natural 'locals only' state possible, was my favorite part of our trip. The city seemed to speak so loudly to me, when the streets and people were so quiet. 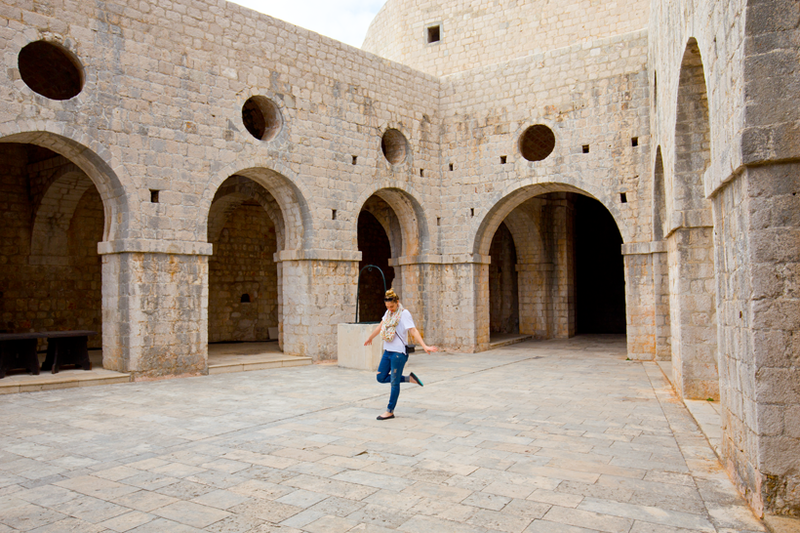 Walking through the Ploče Gate without a crowd, priceless!.. The Stradun, all shiny and inviting..
Stradun. 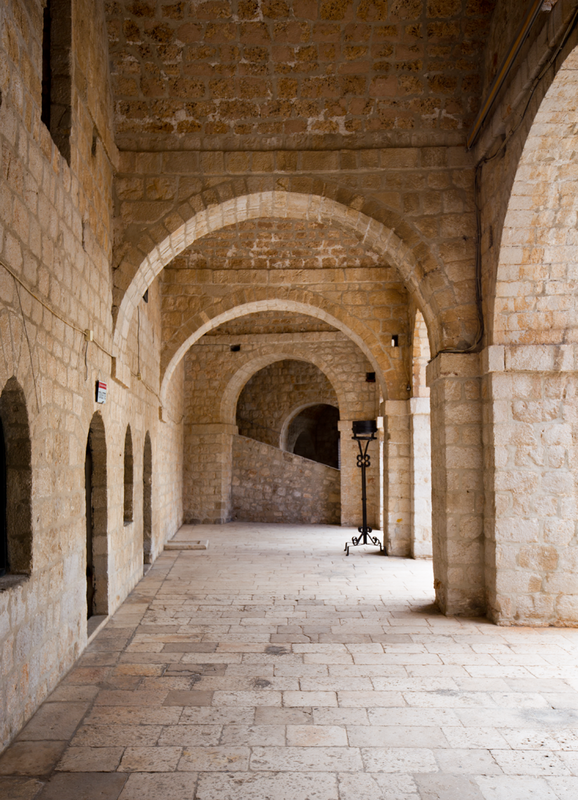 The 300-meter, main pedestrian walkway is called The Stradun or Ploca. 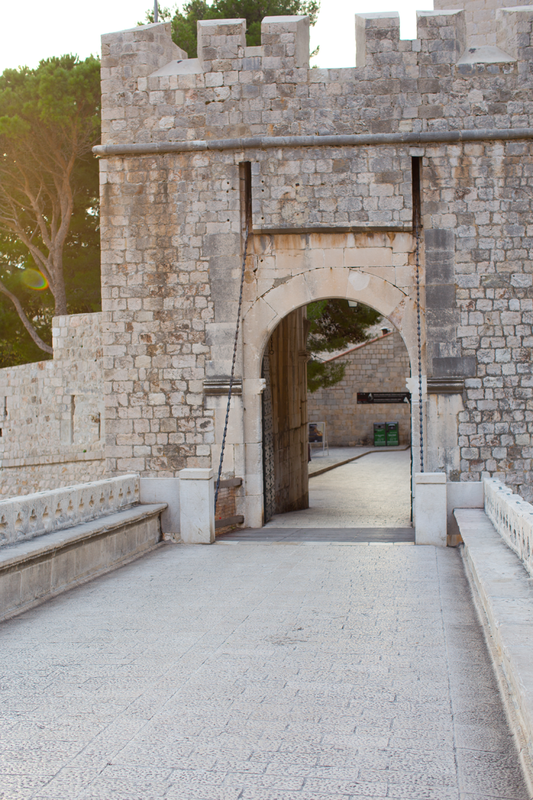 It runs from the Pile Gate to the Ploče Gate. It was paved in 1468, reconstructed after an earthquake in 1667. It is famous for its shiny limestone stones. (Some people say it is marble..) Just walking along it is an experience unlike any other. 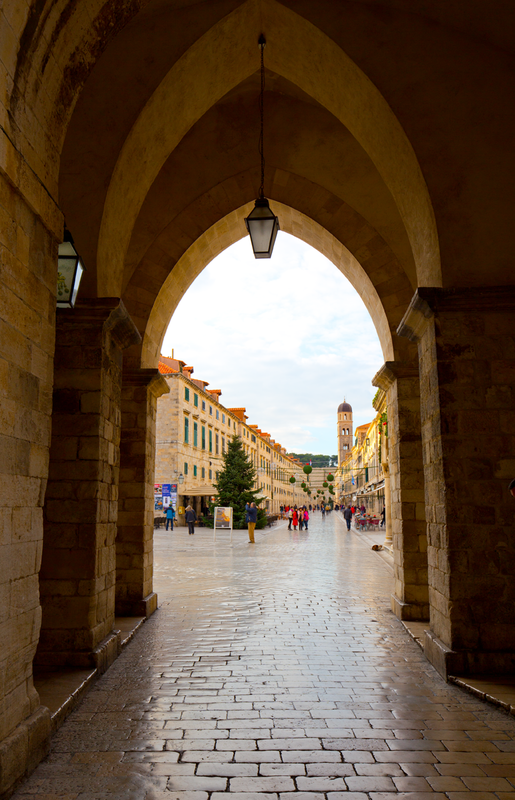 Another fun fact: scenes from the new Star Wars: The Last Jedi movie were also filmed on The Stradun! Seriously guys, the history of Dubrovnik is so fascinating and rich. I am not going to go into that side of things in this post. 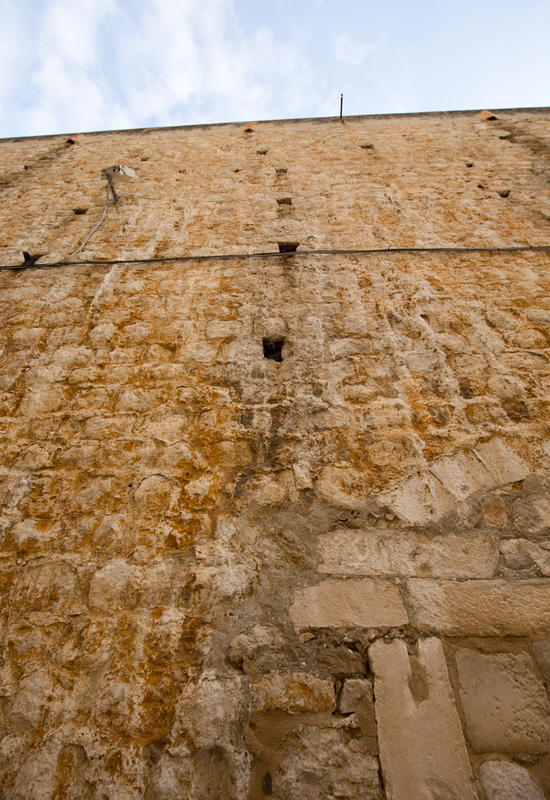 But in general, the bulk of the walls were constructed in the 1300's (though some sources give a very general range of the 12th - 17th century). If you want some basics on the walls, check out Wikipedia. 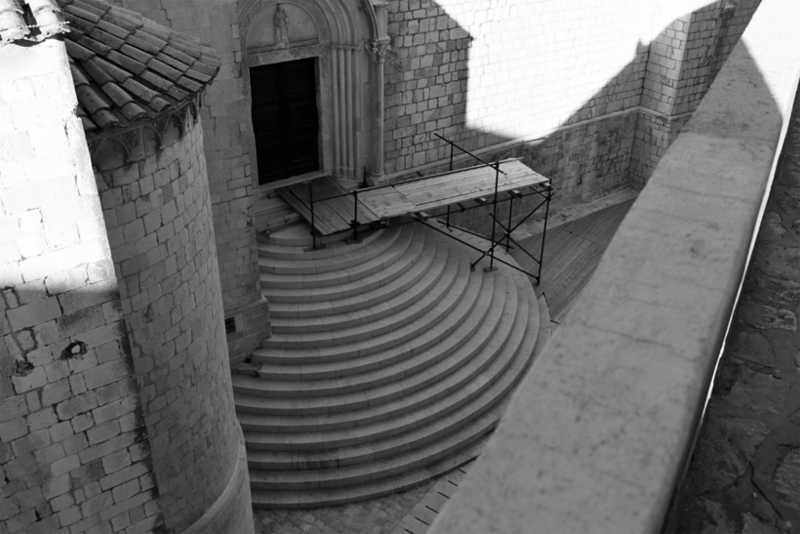 There are also a bunch of great "history of Dubrovnik" websites like this one. 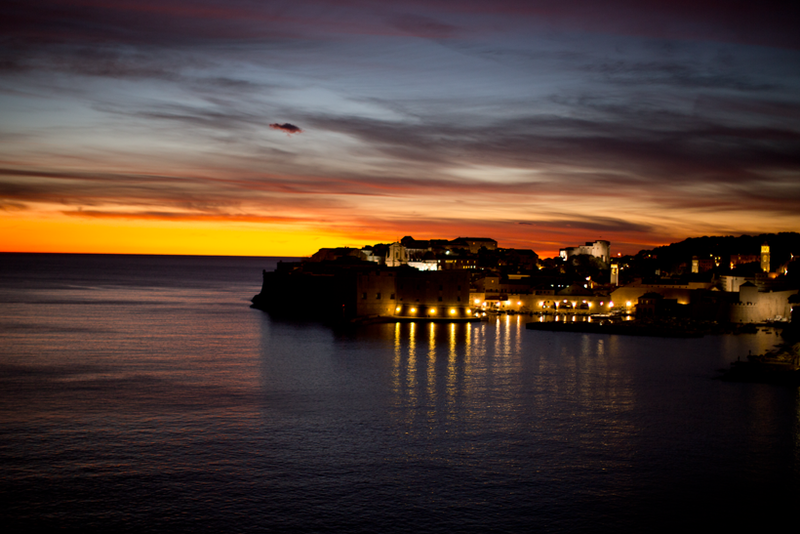 Dubrovnik sunsets. Colors upon colors upon colors. Every night it is like being showered in an intoxicating glow of rose petals, periwinkle clouds, pink cotton candy and melted orange sherbet ice cream. 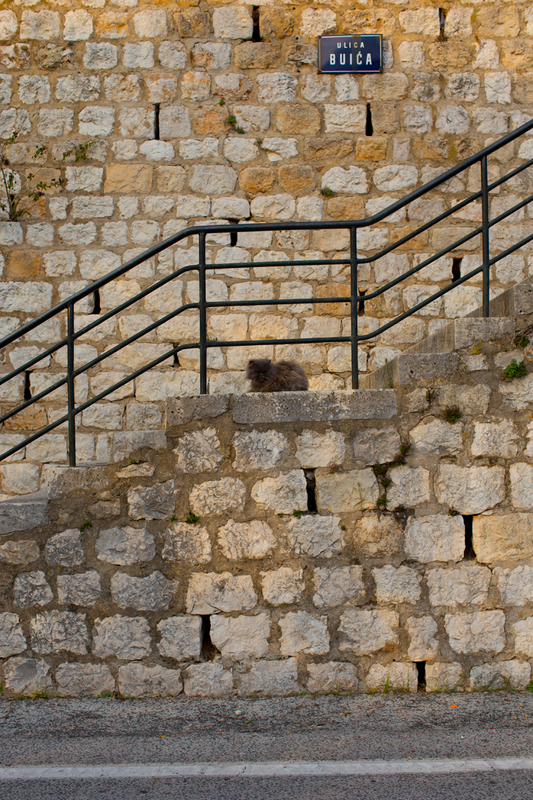 There are a lot of steps in Dubrovnik.. I wanted to walk down every single back ally and side street. 2. Off-Season Hotel (And Airfare) Prices. Boom. Yes. Win. 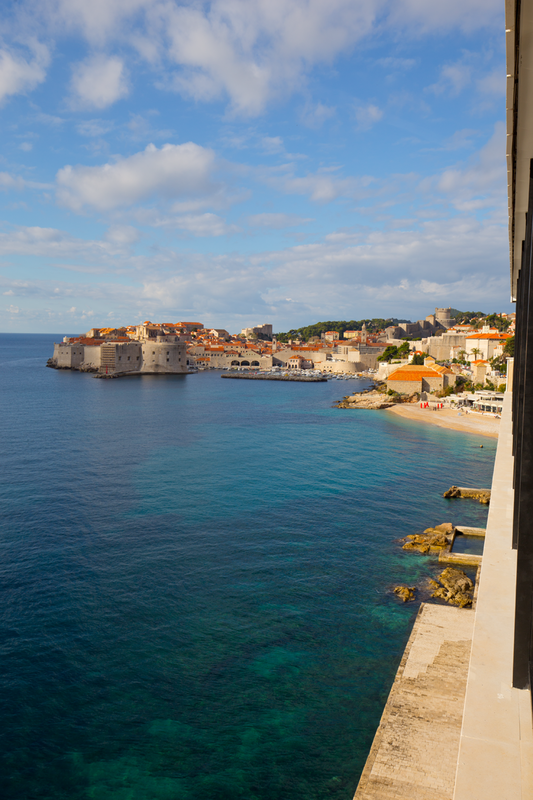 The best part of traveling to Dubrovnik during the off-season? You can stay a bit longer and buy a few more glasses of wine! The off-season hotel prices are awesome. Seriously. And often times your hotel will upgrade you to a better room if you ask nicely and are staying for a few days like we were. Basically, the room we stayed in can double or triple in price during the on season. A bit of warning: A few of the big hotels actually close down for fall and winter! And that being said, we absolutely loved our hotel: Hotel Excelsior Dubrovnik, part of the Adriatic Luxury Hotels. Excelsior was in the perfect location, with the perfect view of Old Town that we craved. It is all about that view guys. Twinkly lights at night and sunbeams over the sea during the day. I seriously could have just stayed in my room and gazed out the window our entire trip and been happy. The hotel staff were subtle, very accommodating and professional. Helpful when needed. The rooms, super clean and lovely - recently updated. And guess what? The little Croatian hazelnut chocolates they put by your bed for evening turn down service are actually vegan! Very exciting. The hotel also had a gorgeous indoor pool and an outdoor oceanside "pool" and a giant bar area and just everything you could ever really want in a hotel. The hotel felt 'quiet' at times, but again, we didn't mind. Off season it is to be expected. The coolest part of that hotel is that it is this modern, luxury hotel that is just a short 5-10 minute stroll down an adorable hill, to Old Town. 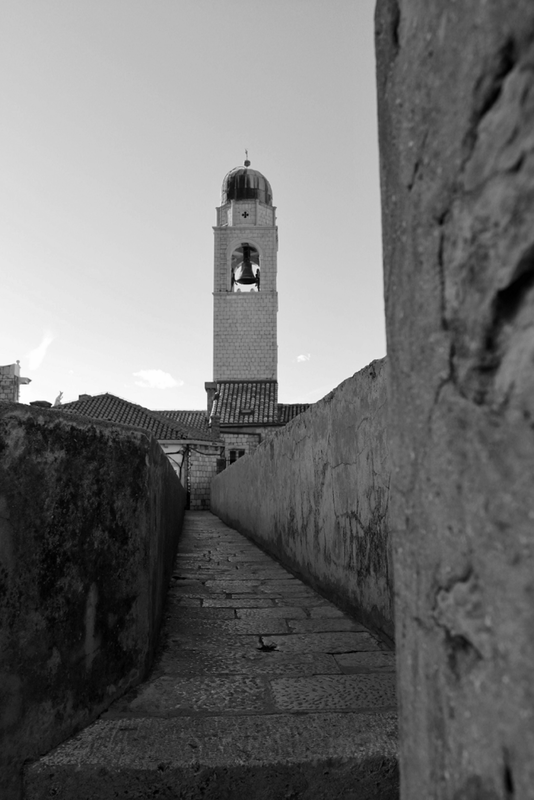 It is like a time machine, going down that hill and entering the gates of the old city. Notes: You walk a lot, but love every minute of it, and you will never get lost. Oh, and Dubrovnik is VERY safe according to everyone we asked. 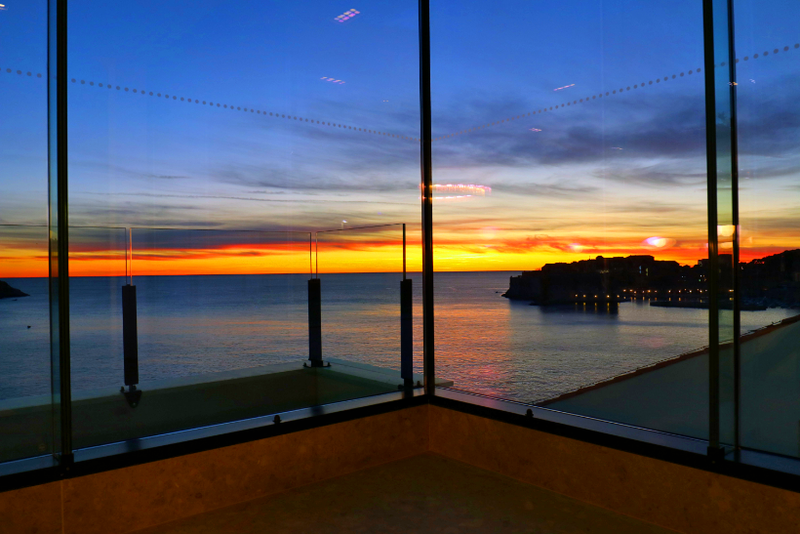 I would absolutely stay at the Hotel Excelsior Dubrovnik again! We were very happy with our off-season room rate. On-season, the rooms can get pretty pricey, so book early. If you have any questions about booking a room, let me know in the comments - there are a lot of room options I know! 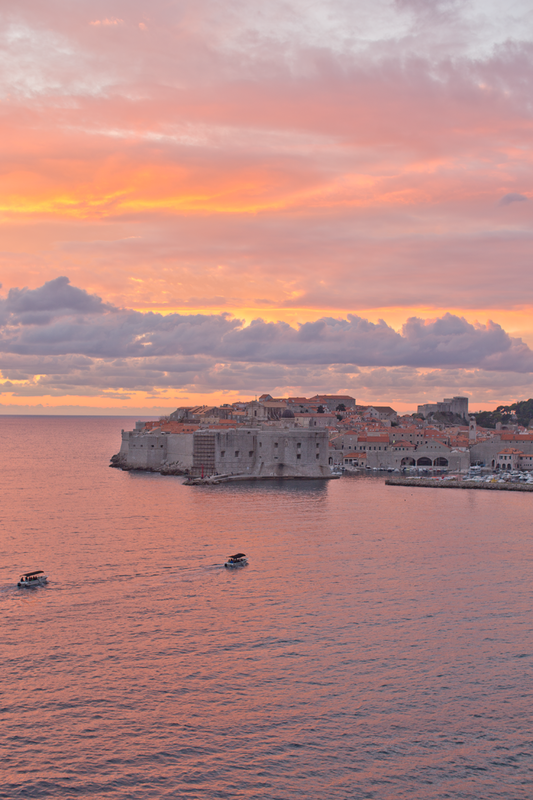 Dubrovnik sunsets are worth the price of admission alone. Watch them in your robe, sipping tea. Hanging out at the lower sun deck area of the hotel. It is empty during the off-season, but still cool to check out the gorgeous water! The cute little walkway from our hotel to Old Town. Ocean on the left. Kitties pop up sometimes. One of the sunsets, view from our hotel lobby..
3. Banje Beach All to Yourself. 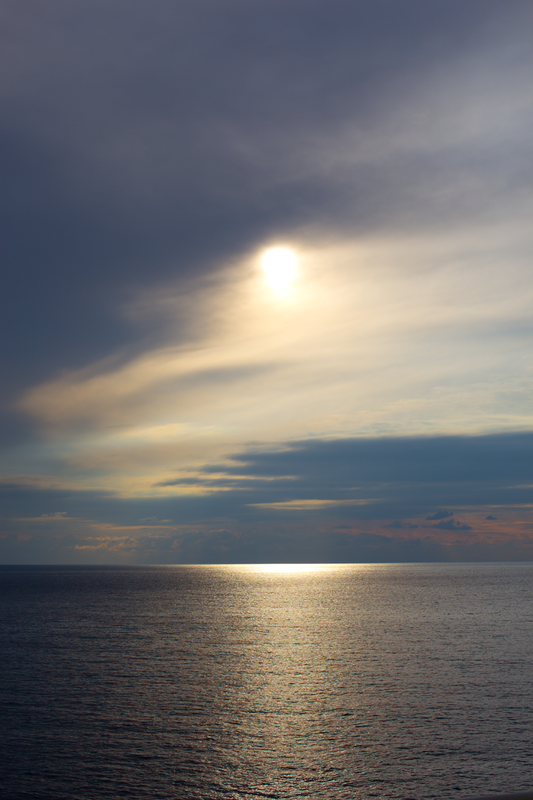 The first time I saw Banje Beach, the sun was setting, creating a gorgeous, luminous glow in the sky. 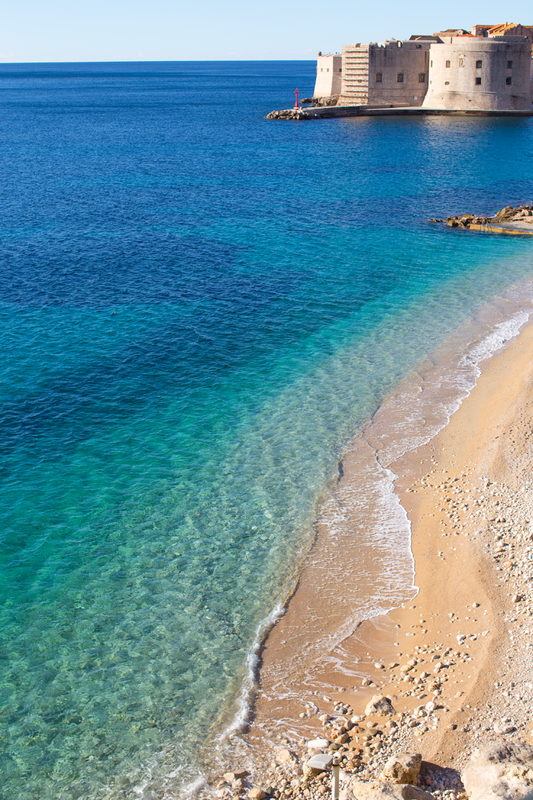 The beach sparkled in deep turquoise blue, with shades of diamond and emerald. I was so shocked that there wasn't a single soul on the tiny strip of perfect coastline. But I guess that is how it is in the off-season when temps dip below 70 and 60 and into the 50s and cooler. Beachside cafes close up shop and locals swap beach towels for scarves and hats. Weather Luck. Luckily, we had some gorgeous fall weather during our stay and we managed to have one sunny afternoon in the mid to upper 60's where we lounged on the beach and I even went into the water for a good half hour, bathing suit an all!! It was one of the most blissful memories I have from that trip. It was like soaking in a cool bath of melted sapphires and diamonds with twinkling yellow sunshine on top. We then lounged on the completely empty beach, in the soft sunshine for another hour or so. So if you are lucky, you can have your beach day in fall! And even with cooler temps, the beach is a lovely little spot to sit, breathe and think. 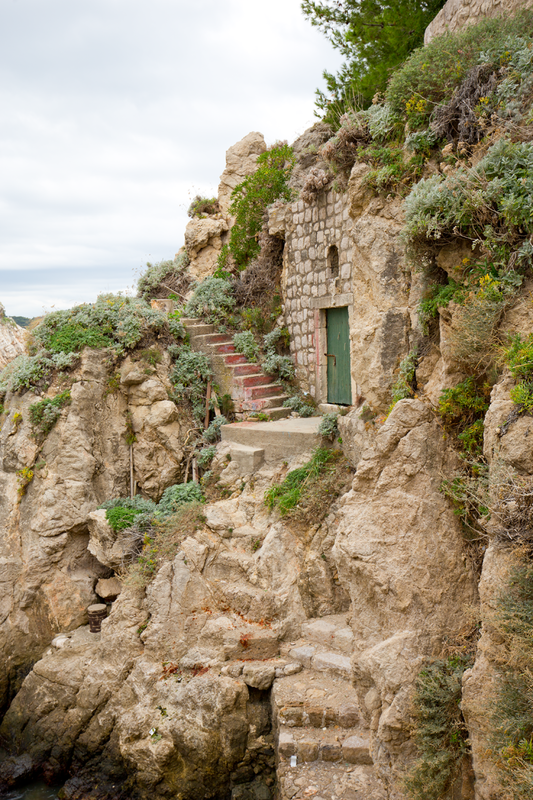 There is an easy stairway path down to the beach that is even lit up in the evening. In the summer months the beach is crammed with beach towels, umbrellas and life of all sorts! The waves jam-packed with bodies and energy. So yes, the beach scene is more of a "scene" in the on season, but as someone who grew up swimming in 50 degree water in Santa Cruz California, I quite enjoyed my Banje Beach in November experience. And I really enjoyed having it all to myself! First look, I knew I needed to do a "beach day" the next day.. Yes, I put on a bathing suit and went in the ocean. Locals do not do that! But growing up in Santa Cruz Cali 50-60 degree waves, this felt like home! I mean, how could you not dive in??.. Warm enough for me. Sparkling sunshine, and I'm in. 4. Walking the Walls, Crowd-Free. I walked the walls solo because my husband is slightly afraid of heights. I don't blame him for skipping this activity because I saw a few people bow out early due to the very narrow wall spots and low edges between you and what feels like a million miles down. 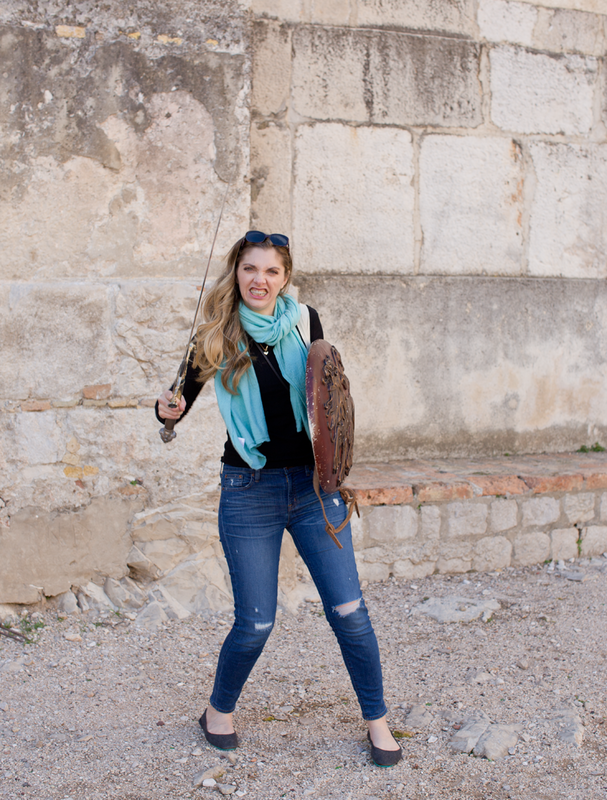 But for the unafraid, walking the walls is a super cool experience. And even better in the off season because you get whole sections all to yourself. There was only one average-sized tour group that passed me and a few couples wandering slowly as well. But mostly, I was walking free of crowds. How epic to be able to experience the walls in solitude, free to absorb the sights, smells, ocean breeze, sounds and sunshine. I can only imagine that waiting in a line to make it through the more narrow parts of the wall would be unappealing and also a bit more scary! It was a bright sunny day when I walked, I was wearing a tee shirt and light shoes and sweating by the end of it. Spoiler alert: There are a lot of stairs so be prepared to work your booty, and eat a good breakfast! I filmed a lot of video footage on that walls. You can see a lot of that in my video at top. The first night we wandered Old Town looking for a place to have dinner we were a bit stunned. Many restaurants with tables all aglow, set up for guests, but most of them having maybe one or two or no one dining at them. Wait, did this mean they were bad restaurants?? 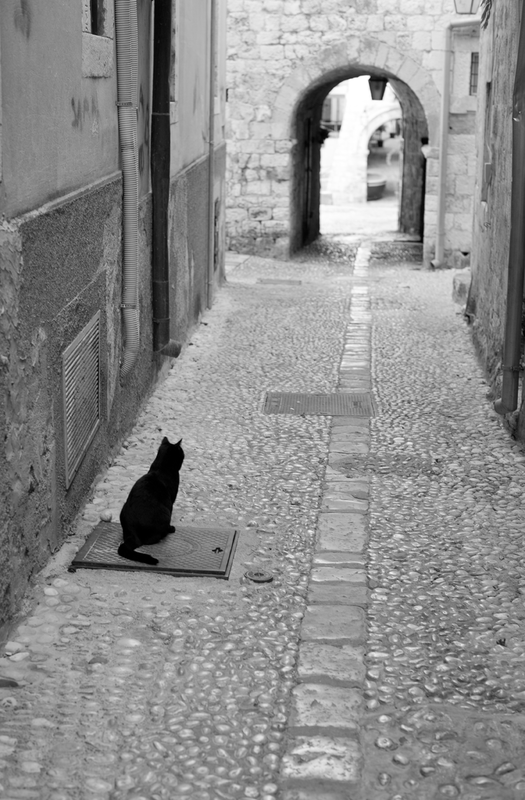 In Los Angeles or New York you would NEVER dine at a restaurant that appeared to be completely empty for hours... ut we chose a pizza and pasta place and sat outside, our table set up in one of the narrow side streets, only quiet kitty cats and a few locals randomly walking by. And guess what? Our food was very good. My husband raved about his pizza. Pasta and salad for me. The wine was very good, service attentive and very swift. And that is the good side of dining during the off-season. Though many restaurants are closed, the ones that are open are all good and give you excellent service in a very speedy way. It almost felt like we had private dining service with a dedicated waiter and chef! Our tour guide said that this time of year, basically anywhere you go will be 'good.' I guess that means that on-season brings about some below average food + service.. but I am not totally sure about that. We dined at the following spots..
- Glam Cafe - Really yummy soy lattes and the best bruschetta! They also have awesome fresh juices. - Pizzeria Oliva - Yummy pizza and pasta. The salad was average, but good. - Mamma Mia Pizzeria - Really delicious pizza! We also had a salad and it was so simple but so good. Ask for oil and vinegar dressing and for the pizza, get no cheese and add mushrooms! 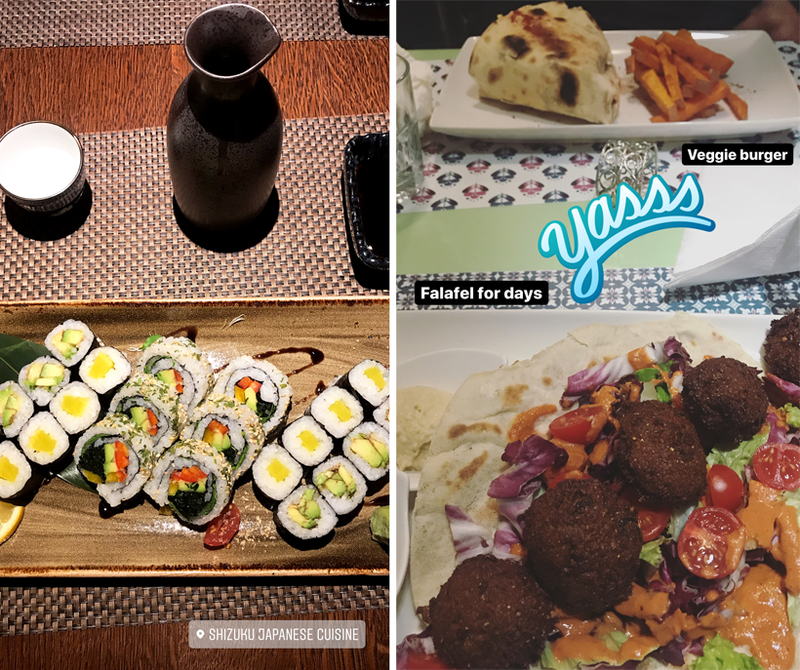 - Nishta - The VEGAN restaurant in Dubrovnik! Yes, vegan... So awesome. We dined there a few times. I loved the falafel as well as the tempeh burrito. We also loved the lattes and desserts. - Mliner Bakery - I went in here at least three times for their pumpkin seed rolls. They made a yummy, cheap snack! They also have good faccocia. 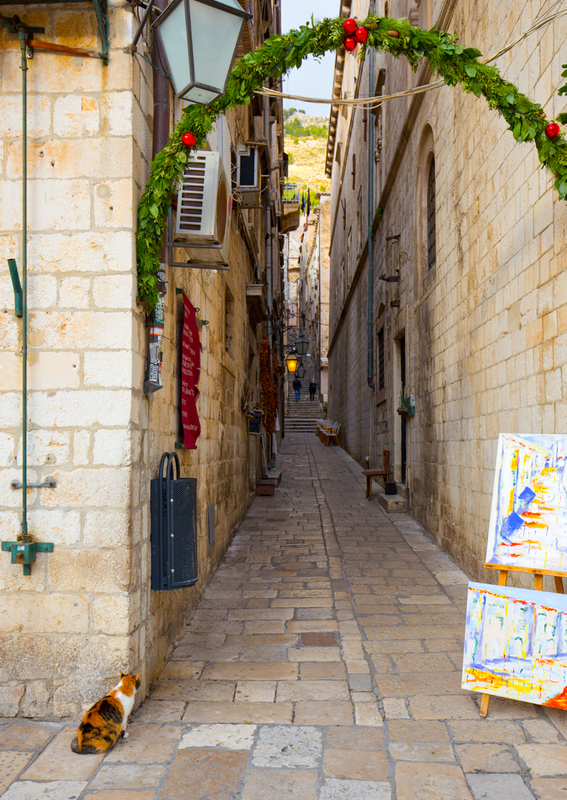 - Kawa - This is actually a gift shop of goods that are made by locals to Croatia or Dubrovnik. But they have a few drinks and vegan gelato in a cold case! They also have chocolate. - Shizuku - This was a place we Ubered to for sushi. Really excellent! I had miso soup, three veggie rolls and some hot sake. Try to sit inside if you don't like cigarette smoke on the enclosed patio. 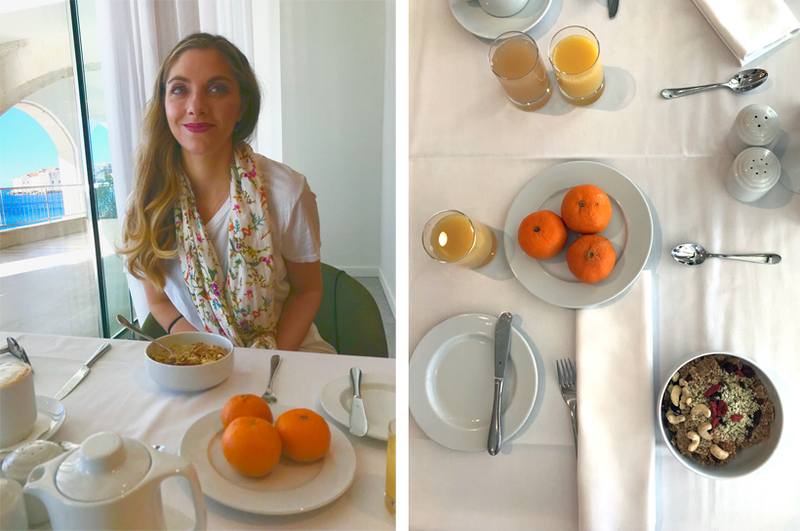 - Hotel Excelsior - We ate all our breakfasts at our hotel. Loved! I loved the cold cereal bar! They had hemp seeds, goji berries, every type of nut you could ever want and more 'superfood' style add-ins! They also had loads of fresh fruit snd non-dairy milk on hand. Oh, and the view was lovely too. In warmer months you can eat outside, but we didn't mind being inside at all. Places we wanted to go to, but they were closed.. Tabasco Pizza and Takenoko sushi. There are also a bunch of spots actually in Old Town that were closed but we googled and would have like to have tried. Too many to name. But a few cafes, a wine bar and restaurants. But again, enough things were open where we ate well and were happy. Oh, also a service called Piknik Dubrovnik sounded super fun, but we decided not to do it since the Lokrum Island boats were not operating. They are vegan-friendly though!! Check it out online. Vegan tip. It was challenging to find some really big and hearty salads. Nishta fed me very well with lots of hearty plant foods, and luckily the hotel breakfast was really good. But be warned that basic fruit + veggies is kinda hard to come by at times. Or at least it was for us! Fill up if your hotel has a fruit-loaded breakfast. The local citrus is really awesome, anything local + fresh is a GOOD choice. Also, I couldn't find good matcha anywhere, so I actually ended up drinking soy lattes. I haven't had coffee in years, so it was strange, but kinda fun/fine for a few days. Herbal tea is easy to find, but Croatians LOVE good coffee... so you will find it everywhere. Wandering through the crevices and corners of quaint Old Town with barely a soul in sight is an off-season perk. Sometimes we came across more adorable kitty cats than people! 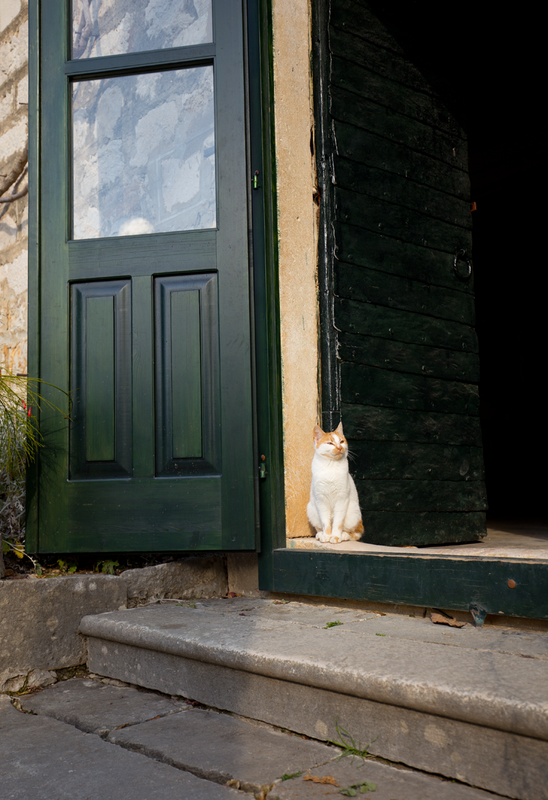 The cats add so much charm to the city. Though I wish they all had forever homes and didn't have to fend for themselves during the cold months, they all seemed oddly happy for "stray" cats. They feel more like "community cats," but still. I think a few of them may have had homes or partial homes that they lived in or near. They all seemed very well fed. And happy. But trust me, every cat I saw put a dagger in my animal-loving heart. I wanted them off the streets so badly. 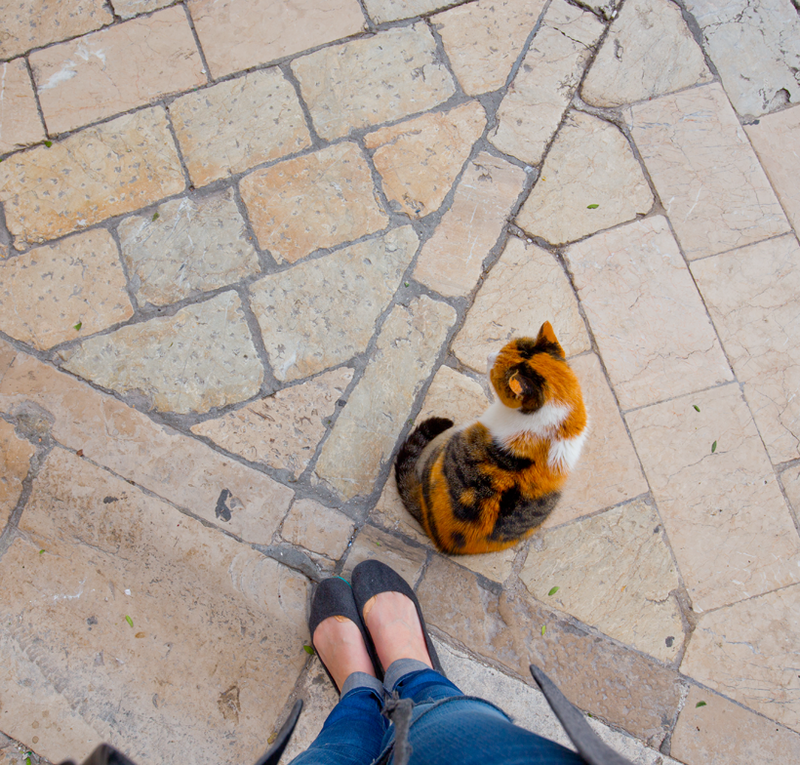 But it did make me so happy every time I saw a local person stopping to pet the cats or just talk to them - which happened a lot. 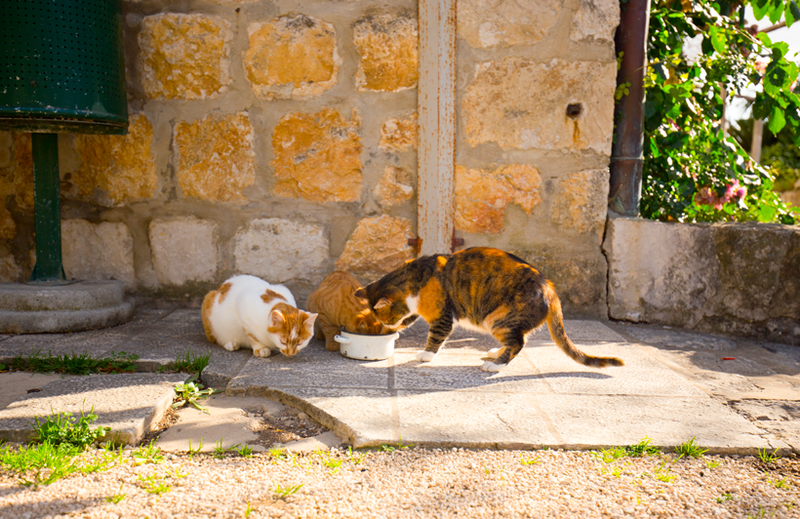 Some people also put out bowls of water, cat food and outdoor kitty homes to keep them warm. 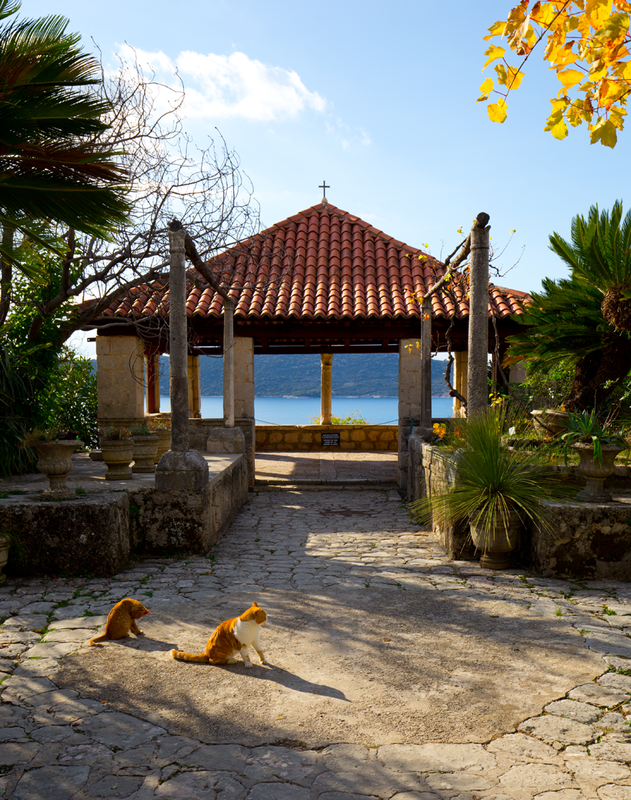 I did find this one Facebook page dedicated to helping find homes for some of the Dubrovnik kitties. You can check it out here. Resident of the nearby Trsteno Arboretum..
7. No Lines or Crowds for Sightseeing Spots. During the off season you do not have to elbow your way through tourists at the big sightseeing spots. Like the walls, as I mentioned. But also spots like Lovrijenac Fortress, the fortress on the hill, across from the main city. It is also known as "The Red Keep" in Game of Thrones. Also totally empty was the Trsteno Arboretum, also known as "the gardens at King's Landing" where the High Garden folk had teas and walked around talking about how much they hated Joffrey. No lines to get into some of the churches and other spots around the city. No lines for the cable car and no lines for dining or drinking! Most places we were the only tourists, maybe one to five others in site, if at all. Here are a few of those spots in more detail..
Engraved in stone, the slogan of the Republic on the entrance to the St. Lawrence Fortress says "Non bene pro toto libertas venditur auro" (Freedom is not to be sold for all the gold). Source + some cool historic photos here. 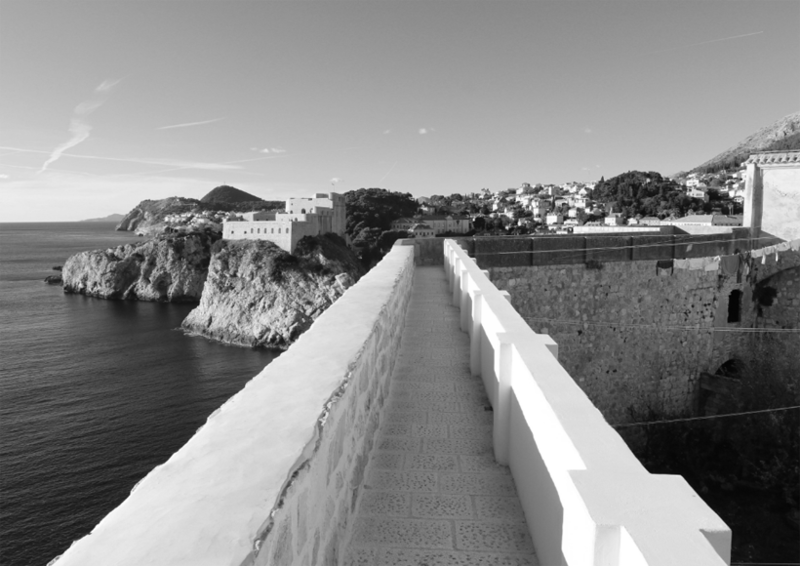 As you climb the stairs to the fortress, you get these amazing views of the cliffs, sea and city walls. No one else here? Well I guess I will do some dancing then. Obviously. 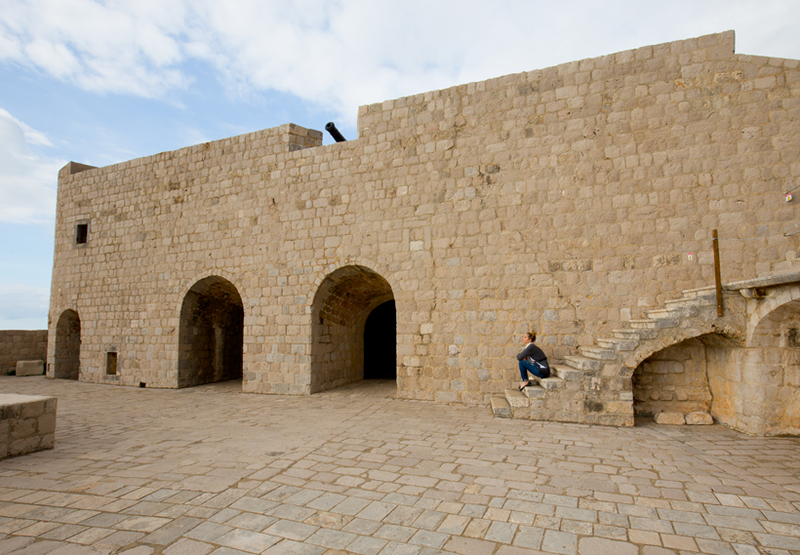 My instincts were correct because there have been many plays performed in this square of the fortress! Cool photos + history of that here. Hi. 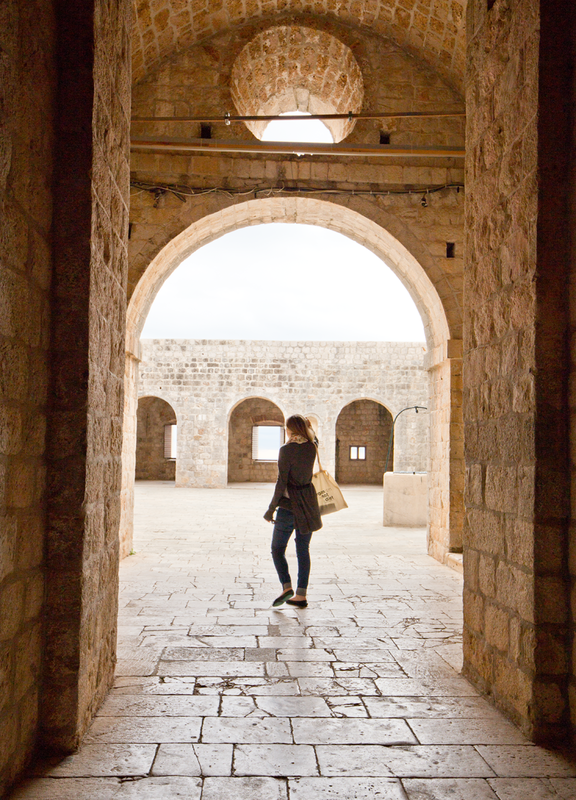 Quiet pause at Fortress Lovrijenac, probably my favorite historic place in Dubrovnik. Just a girl, her fortress ... and a few canons. 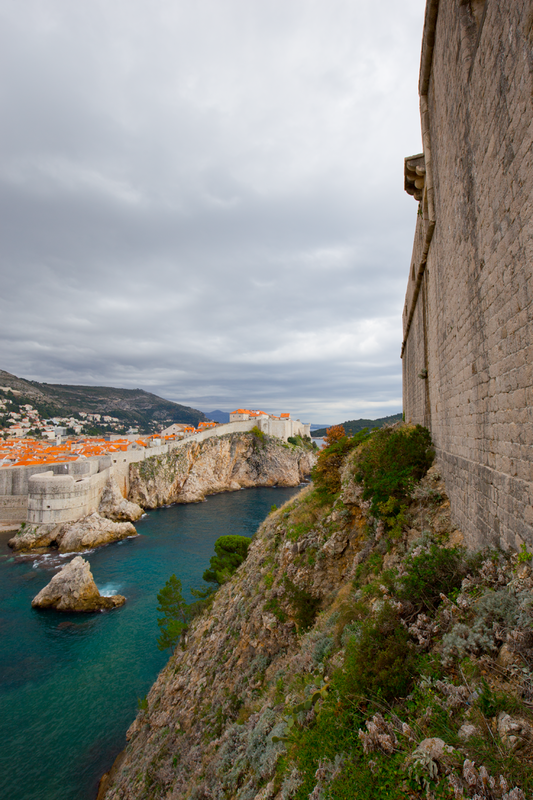 View from the very top..
GOT fans will notice that this was the filming site for the Gardens at King's Landing. 8. 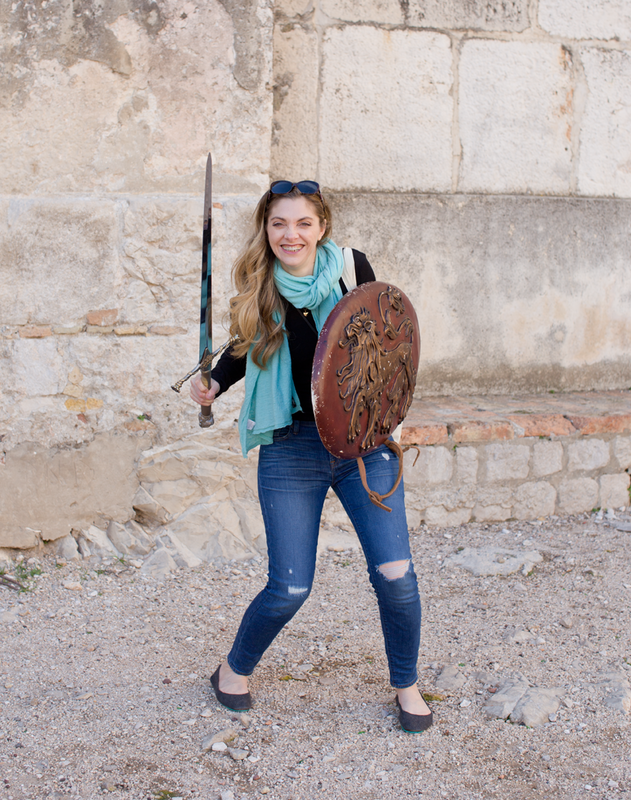 Uncrowded Tours + The Best GOT Tour! 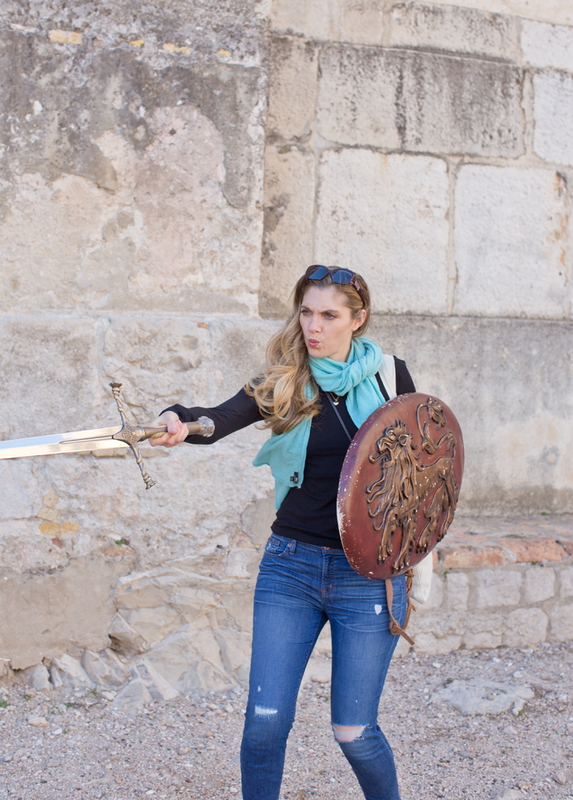 We did a Game of Thrones guided tour. 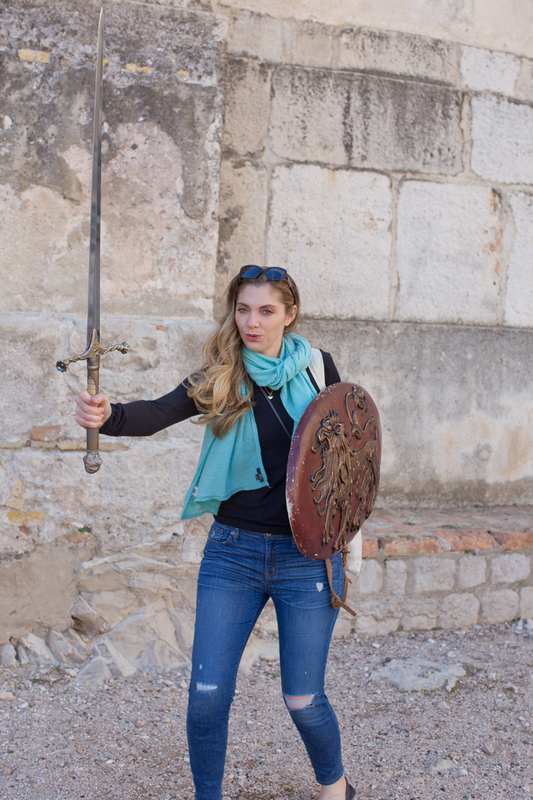 Because, when in Dubrovnik... I actually went on a GOT tour in Belfast Ireland and loved it so much, so we decided to give it a try again. Thank goodness we did because it was a highlight. And because it was the off-season, there were only three people total in the tour! More room to ask questions and really have a one on one interaction with your guide. I really loved our guide Robert! He was so fun and friendly and had a shared passion for the show. 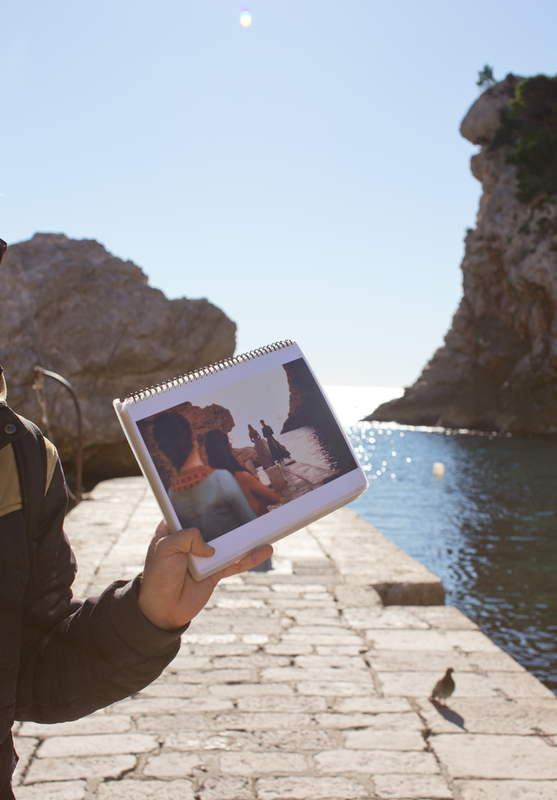 He has been an extra on the show (like many Dubrovnik locals) and so he had some really cool stories about being on set and how friendly and cool the cast members were. He also had a lot of knowledge about the show and answered all my burning questions about filming and locations and how they work around the fact that this is still a living and breathing city with locals and tourists and walls that surroud the city! 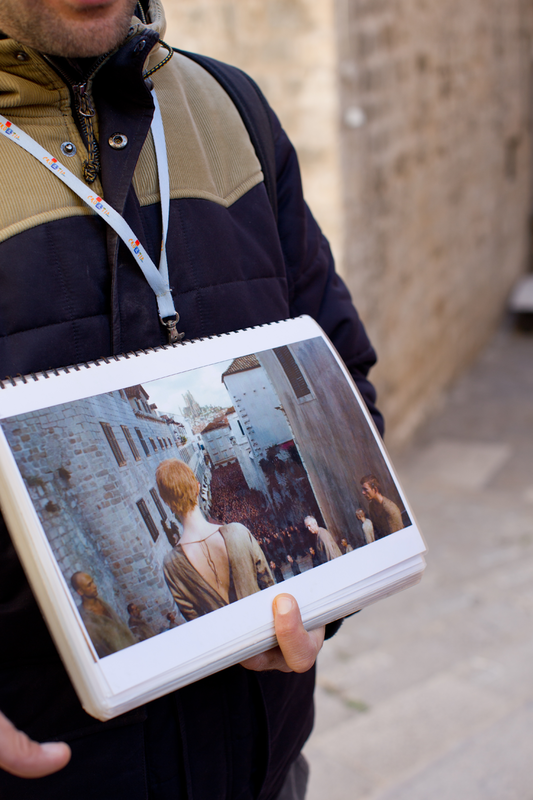 He showed us some major scene spots as well as the location across the way where Joffrey died and he had a book of printed out scenes to compare the show shots to how things normally look. It is SO fascinating to see what is real and what they add or tweek and also what the add digitally to the scene. 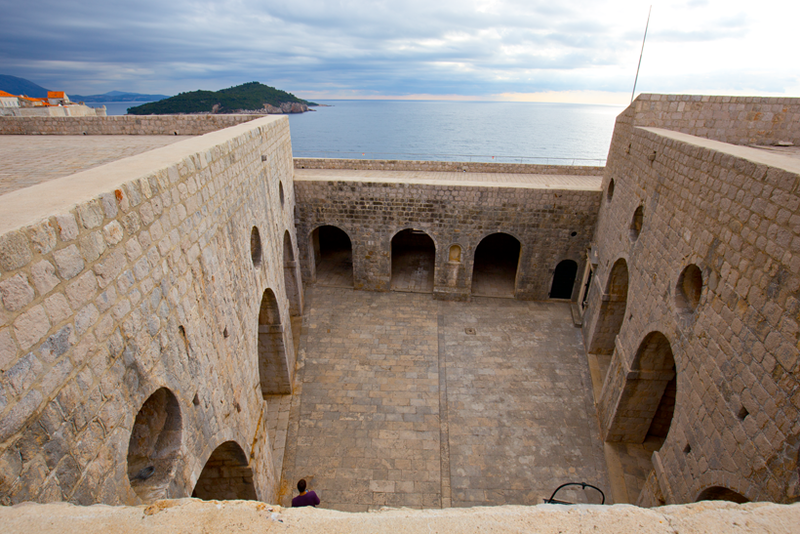 If you are a fan of GOT and visit Dubrovnik, definitely schedule time for a tour with Robert's company! I cannot rave more about how perfect it was to get someone who knows more than you about the show and the city, to really show you around. He also gave us some great dining tips and other information about making the most of our stay. Our GOT tour guide Robert was so wonderful! He was so enthusiastic about the show and knew every little fact about the scenes and locations and filming in Dubrovnik. He has even been an extra several times on Game of Thrones! So helpful/cool to see the scenes from GOT when you are at those locations! Yes, that's a bell prop replica. Had to do it..
9. Better Photos / Less Photoshopping People Out. Not good at photoshopping out masses of people?? 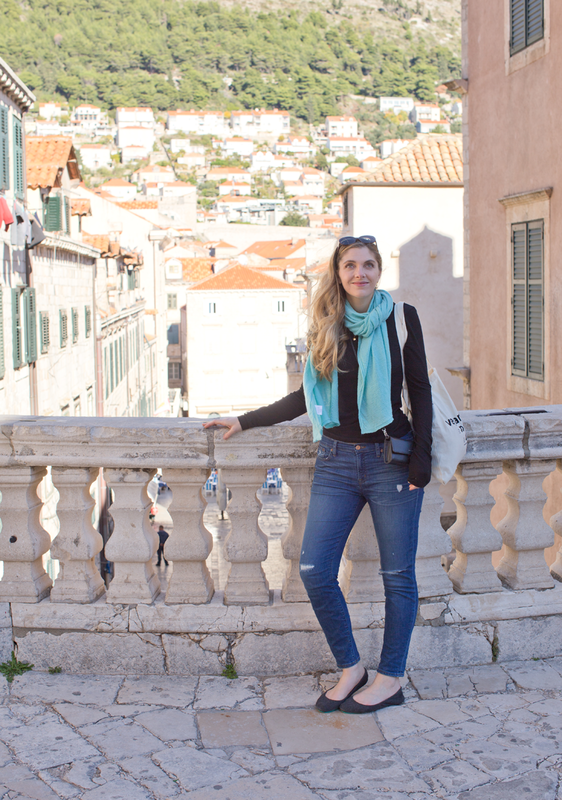 Come to Dubrovnik in the off season! You will get all the gorgeous walls and streets and hotspots in your pics, minus all the people. Maybe a few locals on the main roads, but way better for photography! And if you want really cool photos of just you and the pretty Old Town spots, wake up a bit early and catch the morning sun. hire a local photographer or set up a tripod or use a selfie stick and snap away. The prices for Flytographer (and similar websites) are not terribly cheap, but for the service the company provides (which is securing your a safe + uber talented local photographer with extreme ease), it is so worth it! Special moments can be captured with professional photography and not just your cell phone. Perfect place to wear my new Bhava boots!.. 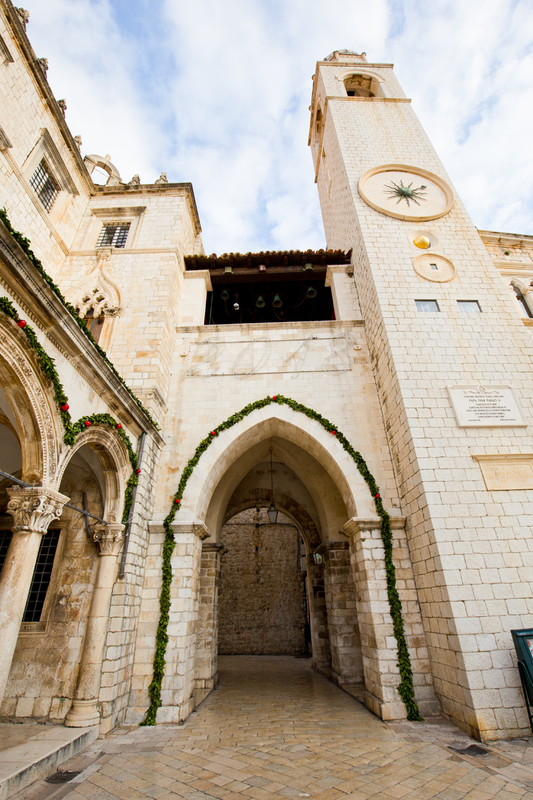 If you make it to Dubrovnik in early December, and through New Year, you will love the charming holiday decorations that are put up. Unfortunately, we were a week before the holiday lights actually got turned on.. though we saw the beginnings of them putting things up and it looked super cute. Oh and apparently they do a big new Year's celebration in the Old Town. How fun! I would definitely do that.. So that is it! Those are my 10 reasons. I could list 10 more, but this post is already way too long. I really tried guys!! But Dubrovnik is just too lovely to edit down. 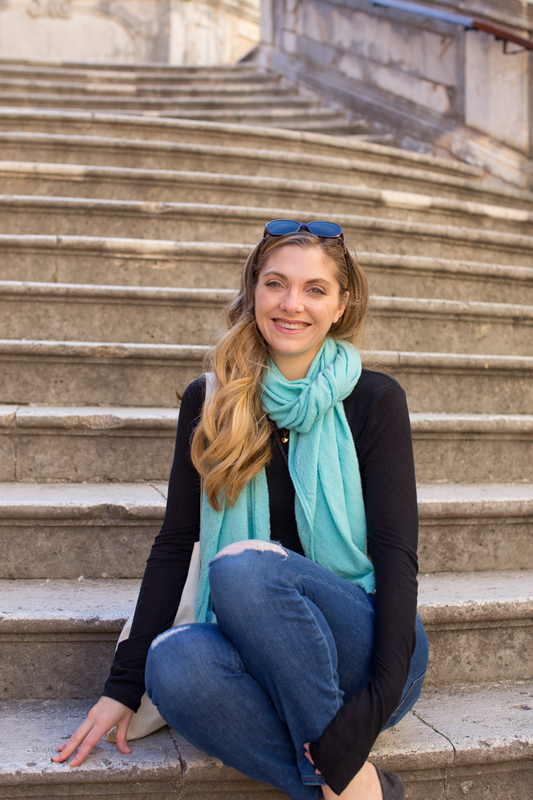 Some more tips for you for Dubrovnik travel..
- Dress in Layers. Some days you might need a light winter coat, other days a tee will be doable. Bring a scarf and some light sweaters. - Shoes. Bring sturdy walking shoes. 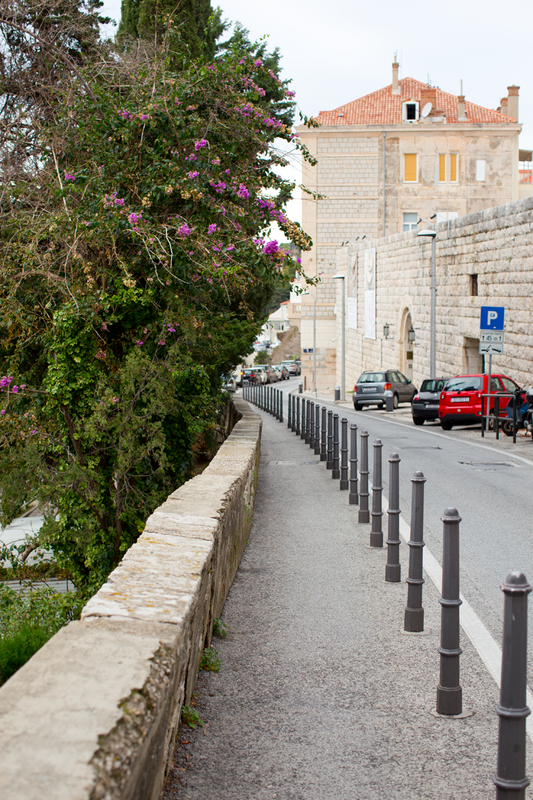 Though Old Town is small, the streets can get slick and the many many stairs can be uneven and without railings. I actually fell our last night in Dubrovnik and sprained my ankle on a stair. I was frolicking about and missed a step. I wasn't wearing sturdy shoes, so that didn't help. Bring some boots if you want to look fashionable, but for long walking days, sneakers are smart. And if it rains, you will definitely want very sturdy, non-slip shoes or even rain boots. - Bring a bathing suit! You never know if you will be lucky and get a fall beach day like me. - Leave some space for goodies in your suitcase! 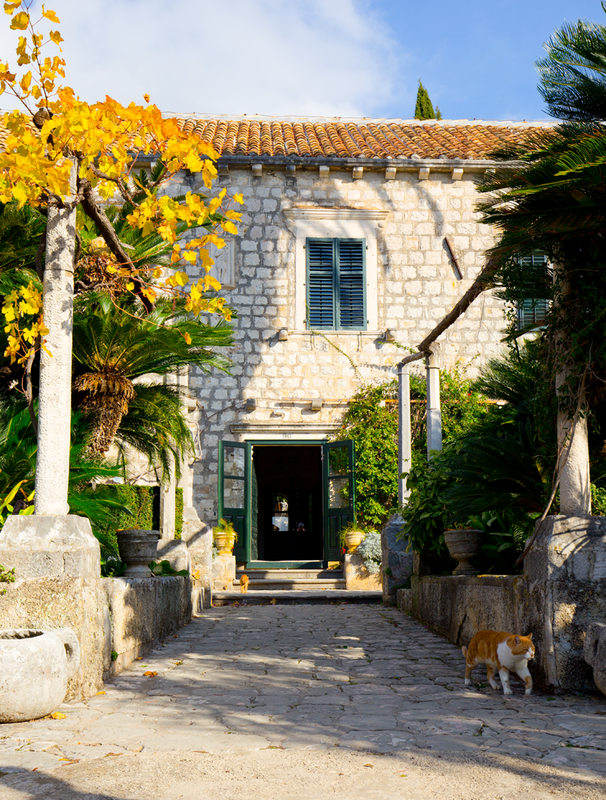 Croatia has a bunch of great goods like wine, sea salts, chocolate, olive oil and more. - Nothing too fancy. I brought two dresses on this trip. I wore them zero times. The locals dress very casually, and the fanciest I think I got was for our photoshoot, and even after that I immediately went back to the hotel and changed into a tee and sneakers. - Pack Light! Since you might need to get on one or a few small planes or even a Ferry to get to Dubrovnik, pack light! Carry on luggage only is key. - Use Uber! Did you know that they have UBER in Dubrovnik?? So helpful. We took it to a restaurant and to the airport as well. In off-season traffic is sooooo much better around Old Town, so take advantage! 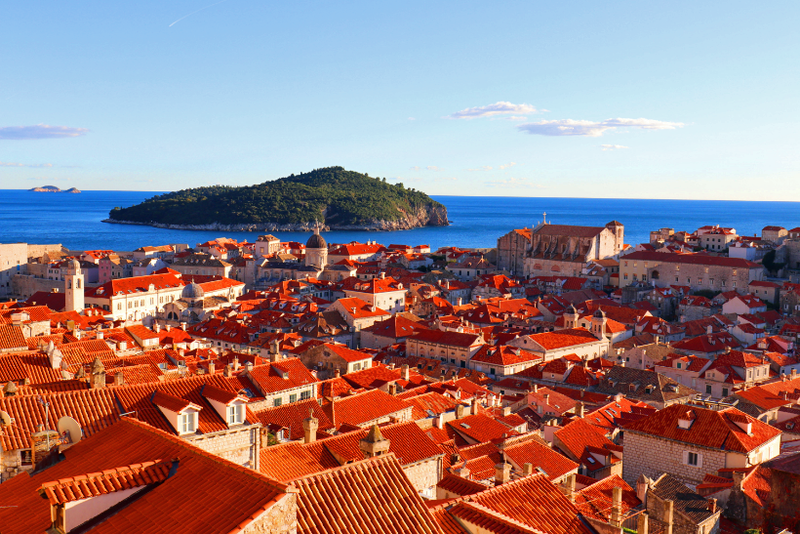 - When possible, fly right into Dubrovnik. Many flights make you go through Zagreb, Croatia. But if you can, skip that step. 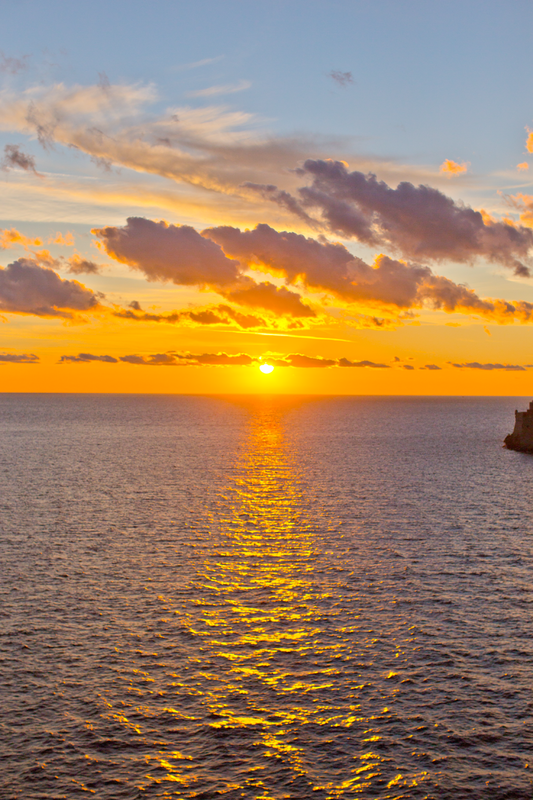 Also, during the warmer months, you can snag a boat ride from Italy into Dubrovnik! One comes from Bari, Italy. 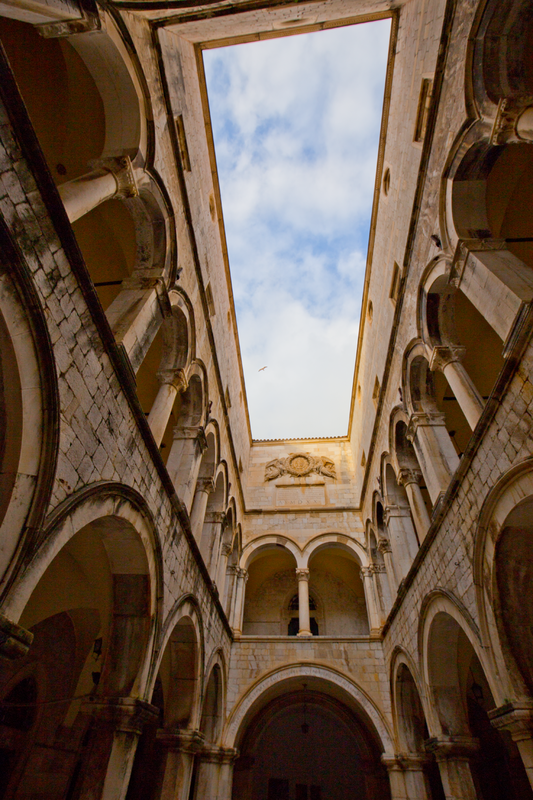 We flew from Barcelona to Dubrovnik - and booked well in advance. The small flights fill up and they only happen a few times a week in some cases. We did not want to miss our flight from Barcelona, because there was not another one like it for a long time! - Do I Need a Car? No way! Cars are a pain in Dubrovnik. You will walk everywhere. The bus system is pretty great too, so we were told. If you are traveling up the coast or exploring other parts of Croatia, with Dubrovnik as your home base, then you might want a car... 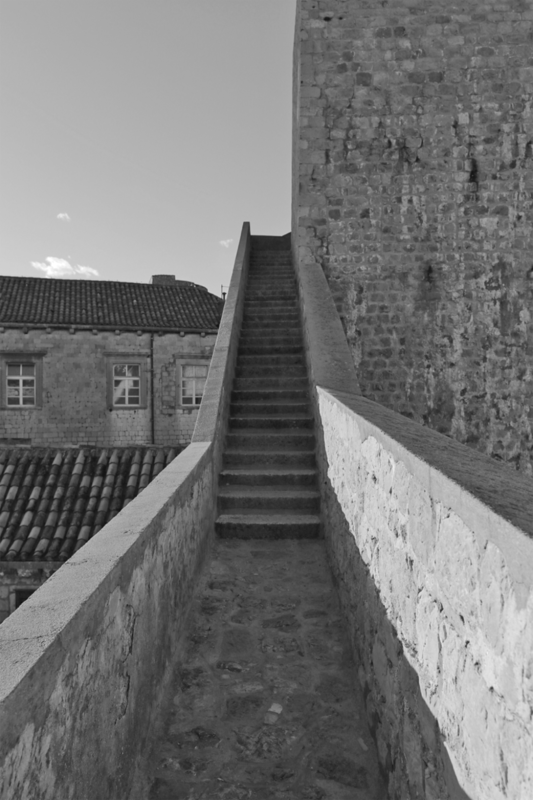 But if your main destination is Dubrovnik, skip the car. Cliffs of the fortress. Feels like time traveling. 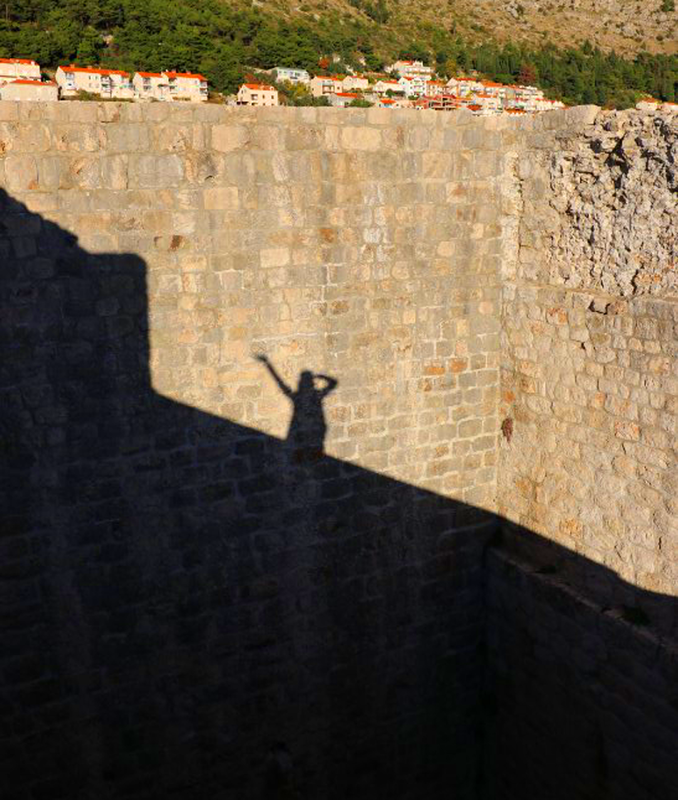 But really, Dubrovnik is all about those walls. Stone walls + pretty sunshine. More architecture loveliness in Old Town..
After sunset, on the Stradun. So shiny. View from the hotel at night. I love how they light up the walls so well! Fortress selfie on our last day of exploring. Our plane ride to Rome! We had a short layover in Split, Croatia. Coastline views..